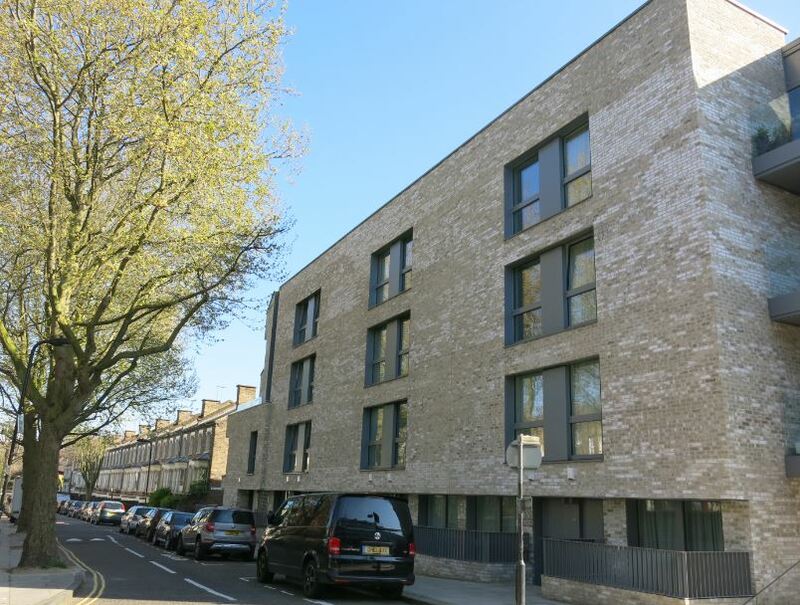 As we saw in last week’s post, as Stage Two of the Highgate New Town redevelopment was winning plaudits, Stage One – the Whittington Estate – was unloved and, in some contemporary accounts, troubled. By 1983, it was described by the local press as a ‘haven for hoodlums’. In 2015, it appears to have become a haven for architects. Though some may fail to see the distinction, we’ll look at what’s changed and examine in more detail the contemporary face of social housing. All this can – and should – be picked apart: the inappropriateness of Oscar Newman’s US model, the ludicrous failure to apply any socio-economic context, the failure to acknowledge that contemporary problems of antisocial behaviour afflicted schemes of very varying design. But the ‘common sense’ of an age is a difficult thing to oppose and it was taken up with gusto with regard to the Whittington Estate. That alarmist headline quoted earlier came from the St Pancras Chronicle. 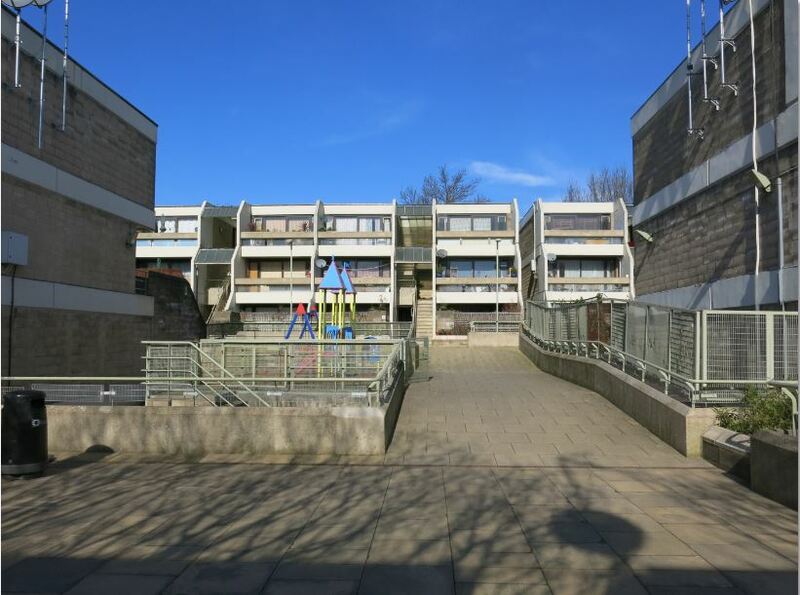 Its report continued, in similarly lurid style, to describe the Estate’s residents living ‘in daily fear of robbery, burglary and vandalism’ and the Estate itself as ‘a warren of lonely walkways and blind spots’. Council officers commented on the ‘large number of potential hiding places for attackers who can then make their escape through any one of the many entrances to the area’. (2) The Council and the police promised to step up their patrols. This was the ‘defensible space’ thesis in full flight and, of course, the problems it describes – the experience of crime and, as importantly, the fear of crime – were real enough even if one resident did wonder what all the fuss was about and thought the design of the estate ‘not better or worse than anywhere else’. 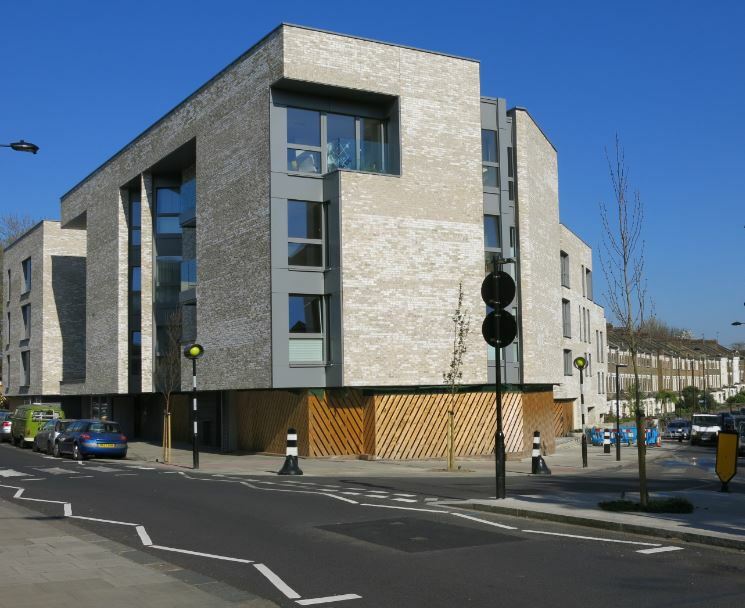 as an experiment in social housing, the Highgate New Town development has failed. Its white walls are daubed with graffiti, walkways cluttered with syringes, the heating system is defunct and cars are frequently set alight in its underground car parks. as it’s pedestrianised the kids all play outside together without fear of the traffic. It’s easy to bump into neighbours and have a quick chat or wave from the balconies, there’s a real sense of community. I don’t have a judgment to offer on all this, only a perspective. That is, whatever the specific factors which played in to the rise of antisocial behaviour in the 1970s and 1980s, they owed far more to dynamics in the wider society than they did to any given form of council housing. The long view and the wider view should allow us to move beyond any simple demonisation of council housing, then and now. We can agree, I think, that the large underground car park built under the Estate – a last gasp of the car culture that briefly held thrall in the 1960s – was a mistake. It was certainly an engineering nightmare. Problems of water seepage instigated a £4m repair job in 2006 which, in conjunction with an overall refurbishment of the Estate, took three years and may in the end have cost the Council – as claims and counter-claims between it and contractors ensued – as much as £10m in total. These, of course, were not council tenants. Around one third of homes on the Highgate New Town estates are now privately owned, a product of Margaret Thatcher’s Right to Buy legislation of 1980. 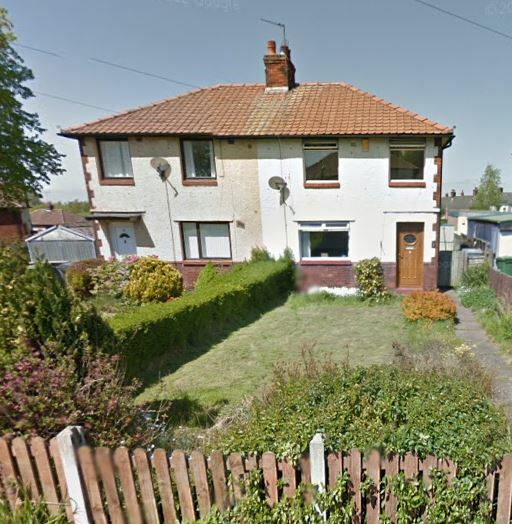 For one former tenant, who bought his five-bedroom home for £39,000 and has seen its market value rise from £70,000 to over £600,000, this was ‘perfect, absolutely perfect’. These new leaseholders, overwhelmingly belonging to the professional middle class, love the Estate for ‘its Modernist aesthetic and attention to detail in the design’ and ‘the amount of space you get for your money’. 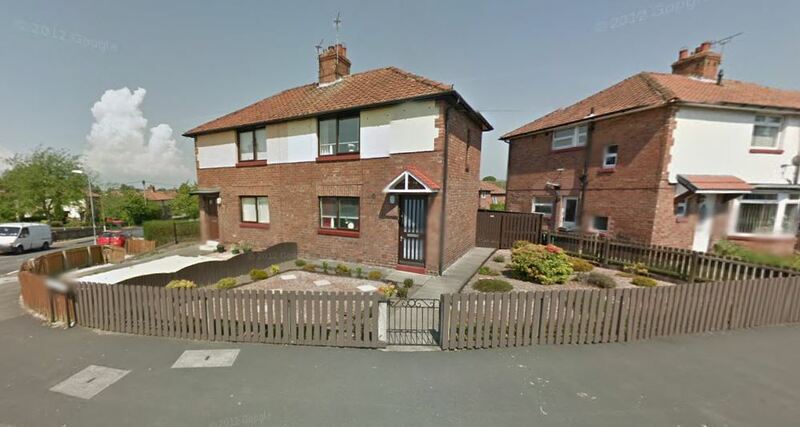 (8) Yes, this is the council housing we’ve been taught to despise. The newcomers are often active in the community and likely to praise its friendliness and mix. I’ve no interest at all in criticising them personally but, as a group, they are the beneficiaries of a process that in London particularly has vastly reduced the amount of affordable social housing available to those who need it most. There’s a lack of benefits, lateness of benefits, increases in rent, increases in food prices, electric, gas… just a general increase in everything. Working-class families who once dreamed of moving into council homes of the quality of Highgate New Town are now, with no possibility of buying a property, forced to rent inferior and costly accommodation from private landlords whose income we subsidise though Housing Benefit. Over one third of council homes purchased through Right to Buy in London are now privately rented, some are even rented back by local authorities. (10) Madness! Critically, councils were prevented from using the receipts of council house sales to build new homes. Presently, most of the new social housing being built is predicated on a financial chicanery – the sell-off of older social units and real estate, the construction of homes for sale and homes for ‘affordable’ rent which are nothing of the kind – which destroys existing estates and communities. In the current topsy-turvy world of housing finance, Camden Council – which still manages directly about 33,000 homes in the Borough and houses around a quarter of the population – probably deserves some credit for this. We bought this flat knowing there was a bit of a risk, because it was half council and half private. We were told there was a lease that was enforceable. We said we were quite worried, but they said they could not put laundry on the terrace or rubbish on the terrace. Now they are telling us the lease is not enforceable. To be fair, as this blog always is, there’s a pretty long paternalist tradition of Council tenancy conditions banning laundry and the like on balconies to encourage ‘respectability’ within the working-class communities. It’s just that the attempt gains piquancy when tenants are expected so directly to defer to middle-class sensitivities. Now all this will have frustrated the architectural groupies among you because most would see the real significance of the new scheme in terms of its design standards and principles. The £9.25m Chester-Balmore Scheme (as it’s known) built to replace the temporary and failed high-tech first phase of Stage Two, designed by Rick Mather Architects, is the first social housing scheme in the country and the largest scheme of any kind to be built to Passivhaus standard. The buildings’ insulation, triple glazing, high-tech boilers and air circulation systems – the only actual heating provided is a towel rail – are all intended to keep fuel bills down to less than a £100 a year…and help save the planet. In terms of appearance, the scheme’s two residential blocks of stacked maisonettes with universal ground-floor front door access are intended to ‘fit’ the existing streetscape while a larger ‘gateway’ block (which will include new shops) marks the corner of Chester Road and Raydon Street. (12) Observers will have different views on how well its fulfils this brief. Perhaps I’ve treated this last and significant development rather briefly but I may already be trying your patience. I hadn’t expected to write so much on Highgate New Town but the more I researched the more it revealed of the architectural fashions that have shaped council housing and the political and social forces which have moulded the lives of its residents. I’ve no great conclusion other than to advise a longer view which accepts that tastes change and context is all. It is the latter which inexplicably is so often forgotten in much of what passes as analysis of social housing and it is that omission which has caused such damage to what should be understood as one of the proudest achievements of our welfare state. (6) The reference to six architects comes from Dan Carrier, ‘Estate revamp “sacking” chaos’, Camden New Journal, 26 April 2007; the £10m figure from Dan Carrier, ‘Town Hall pay out millions to sacked builders’, Camden New Journal, 22 October 2009. Residents were complaining that the repairs had been carried out inadequately as late as 2011 – see Kate Ferguson, ‘Highgate residents hit out at “shoddy’ management of estate’, Ham& High, 14 September 2011. Thanks again to Modern Architecture London for permission to use photographs taken in August 2011 of the now demolished section of the original development. Its post on Highgate New Town offers a range of good images and further detail on the development as a whole. And my thanks also to the excellent resources and always helpful staff of the Camden Local Studies and Archives department. Last week’s post looked at Stage One of the Highgate New Town development – Peter Tábori’s Whittington Estate. 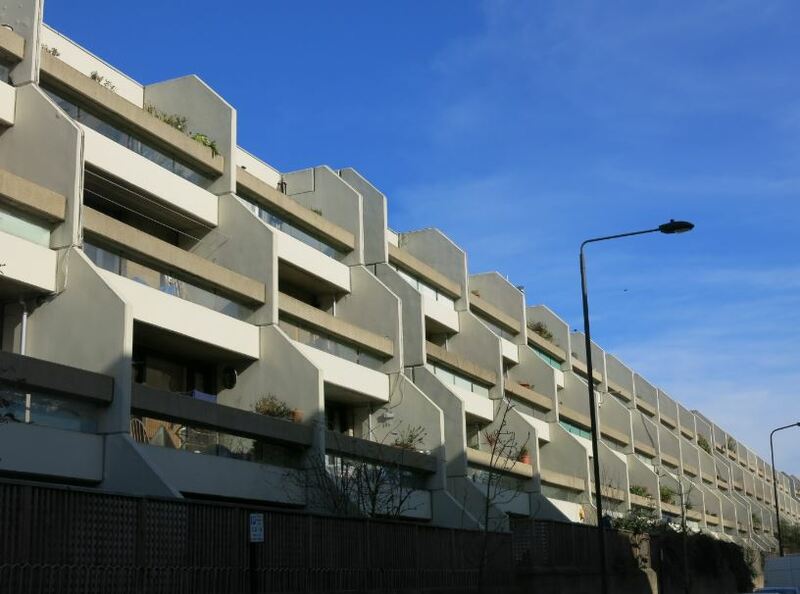 That’s the estate which sets architectural pulses racing now but back in the day it was unfashionable even before it was finished in 1979; it was Stage Two – very different in design and conception – that won awards and kudos. 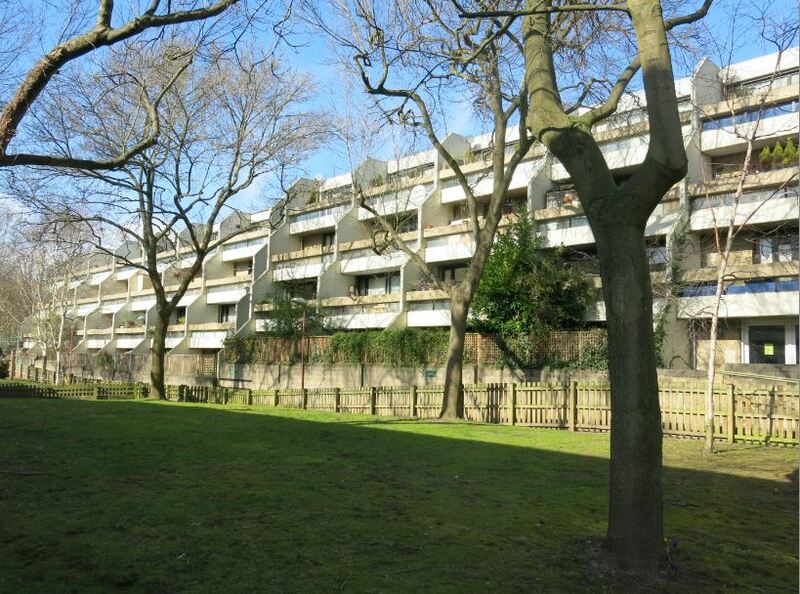 The construction problems and delays associated with the Whittington Estate had led Camden to decide upon a very different path for later phases of the redevelopment as early as the mid-seventies. In the first place, however, the Council opted for a quick fix but the prototype design it selected was surprisingly innovative in both technique and form. In the interim, the next stage of Forrest and Palacio’s plans – usually called the Dartmouth Park Hill Estate – was designed with a very different aesthetic and garnered very different reactions. Stage One, the Whittington Estate, had had a difficult birth and turned out – in architectural terms at least if not to the many it provided a fine new home – an unwanted child. It is a typical story of the 60s and 70s – a dramatic swing of attitude away from massive high density redevelopment in complex forms of innovative construction, towards gradual renewal at lower density in low rise, traditional forms of housing using traditional construction. 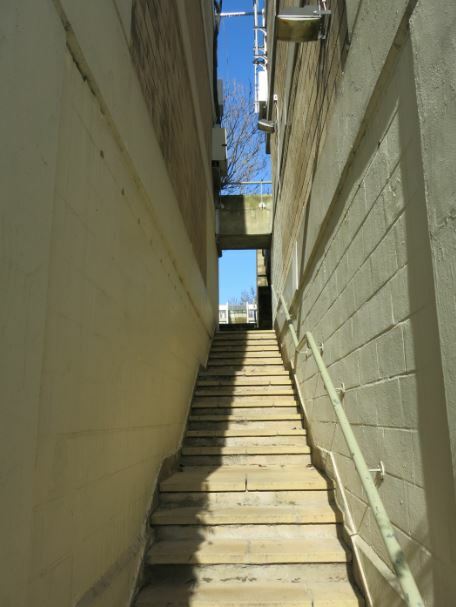 This was reflected in the new guidance from the then Department of Environment supporting gradual renewal of run-down areas through a combination of rehabilitation and selective infill. Camden itself had adopted a policy requiring all families with children to be housed on the ground floor. Thus it was that around half the houses originally scheduled for demolition in the succeeding phase were retained and refurbished. 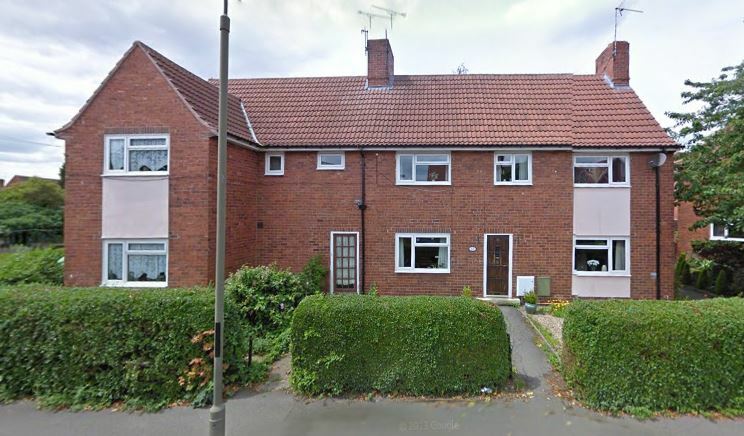 The new-build began in 1978 and was finished in 1981 at a total cost a little over of £1.5m, providing homes for some 287 people in a combination of two and three-person flats and four to five-person houses. Camden’s signature dark-stained wood remained and the scheme retained some colourful elements and flourishes in its glazed and metal-framed access stairways, white panelling and red-brick detailing. But, brick-built and two-three-storey, it was in essence – as Stonehouse describes – ‘a return to housing which is more clearly related to its surroundings’. Even the Camden Borough architects, hitherto whiter than white, switched to yellow brick with red stripes and pretty ironwork. memories of Edwardian villas and the welcoming scale of a delightful suburbia. Every element of the design, down to the last detail of sign-writing, has been carefully considered and sensitively handled. The environment created is rich in content, colour and texture, and the imagination is stimulated by a wealth of delightfully rendered images and totems – entrance urns, porches, balcony ironware, trellises, archways. It is not often that nineteenth century housing appears at a disadvantage in comparison with new-build, but this scheme enhances the surroundings. 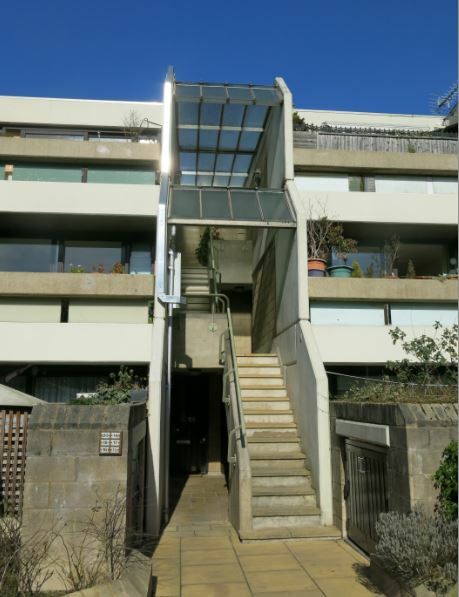 If all this does suggest to modernists a too homely and home-spun design, the scheme remains striking, particularly in its long three-strong barrier block fronting Dartmouth Park Hill. The red, green and white detailing adds colour and interest and the block possesses a scale and presence. The access stairways break up the long terrace, creating a deliberate echo of the Edwardian homes facing, but it’s still the later development which has more bravura. Balconies to the rear provided a little outdoor space though Stonehouse expressed concern that some were already ‘a little cluttered’ – a minor point perhaps but (as we’ll see next week) one that can cause alarm to those for whom this small sign of council house tenants taking ‘ownership’ of their homes can spoil the aesthetic they seek. The short terrace of houses on Raydon Street facing the Whittington Estate looks timid in comparison – a ‘thoroughly turned-tide, pointless humility’ according to Douglas Murphy (7) – but the small triangle of houses built around an attractive, green open space on Doynton Street looks pretty good and the resident I spoke to was happy to live there and happy to have it photographed once she’d ascertained there was no nefarious purpose. 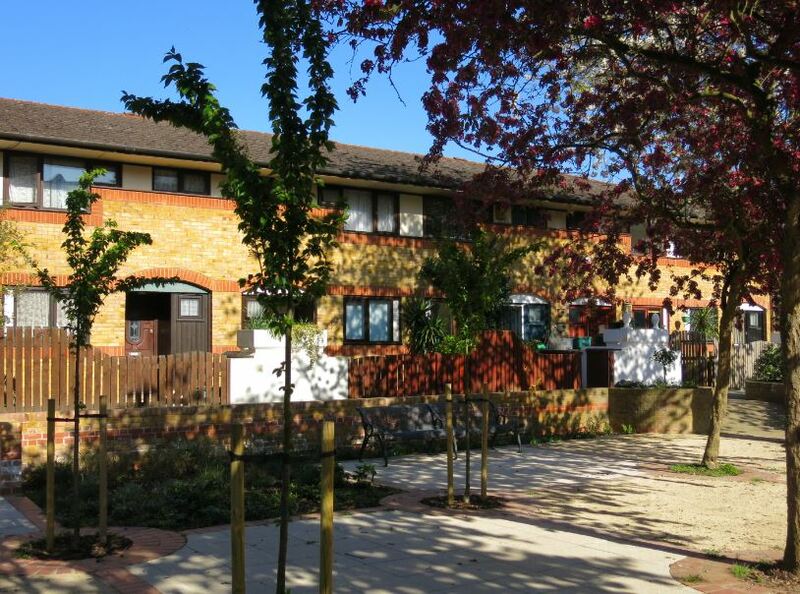 While wandering around the Estate, I also met the widow of one of the original team of architects – also a resident (and a tenant, mark you, not a leaseholder), she too was very fond of the scheme and proud to have it recognised. 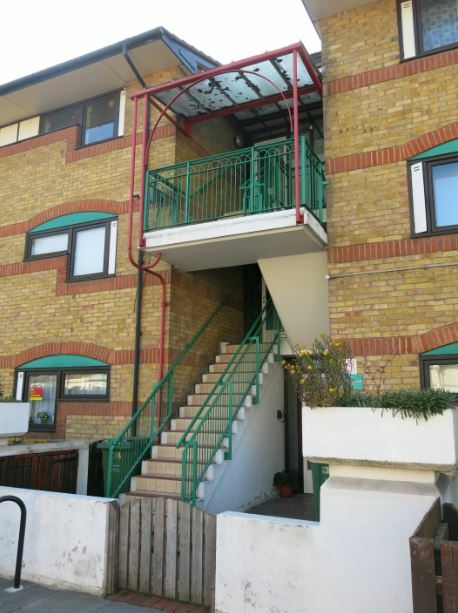 It’s due to have its heating and water systems updated and she was anxious that new exposed pipework would disfigure the archways providing through access. I hope the Council will be sensitive to this. Finally, and a clear prefiguring of another concern that will take centre-stage next week, the public open spaces of the scheme were kept to a minimum for reasons of maintenance and – the key issue perhaps – security. Roads were retained either as roads or as pedestrian through-routes – this was ‘good’ open space – offering permeability in the modern jargon. 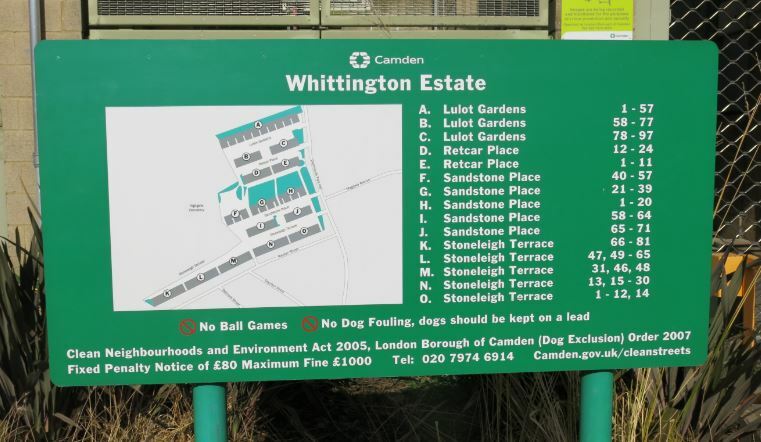 The separation of traffic and pedestrians and the very enclosedness that was an initial virtue of the Whittington Estate were now seen as problematic, estates themselves had become a problem. 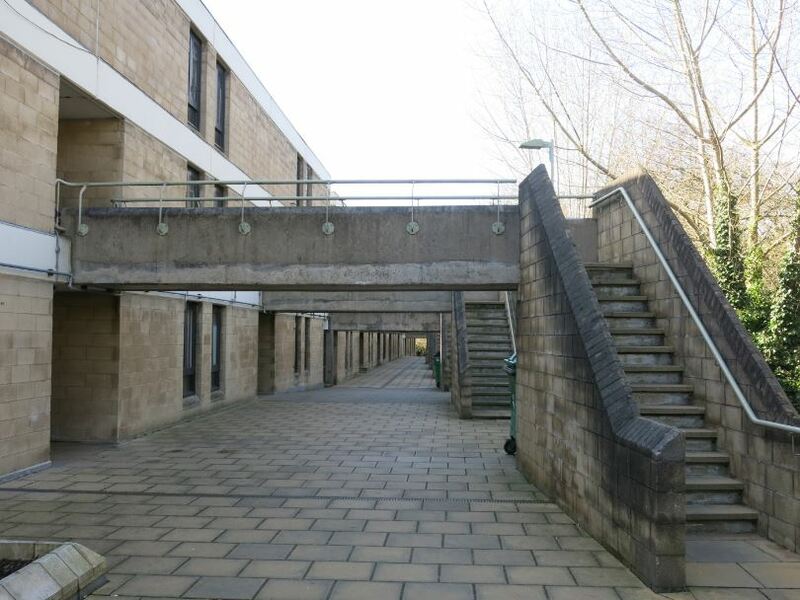 The next post will look at the next trend that would mark our understanding of council estates, the theories of ‘defensible space’ that dominated the nineteen-eighties. It will examine the fall and rise of the Whittington Estate, the changes of tenure which have transformed council housing and the very latest building forms and principles which replaced the flawed design of the High Tech element of this second phase of the Highgate New Town development. Not only have we the obligation to rehouse thousands of people in the borough; we also have an obligation to house them well and to house them in the most pleasant and elegant surroundings we can manage. Camden did that in some style. (3) My thanks to Modern Architecture London for permission to use photographs taken in August 2011 just prior to demolition. Its post on Highgate New Town offers a range of good images and further detail on the development as a whole. With thanks to the excellent resources and always helpful staff of the Camden Local Studies and Archives department. This is a story about fashion – the changing ideas and shifting trends which shape popular beliefs about housing and the planners’ briefs which emerge. 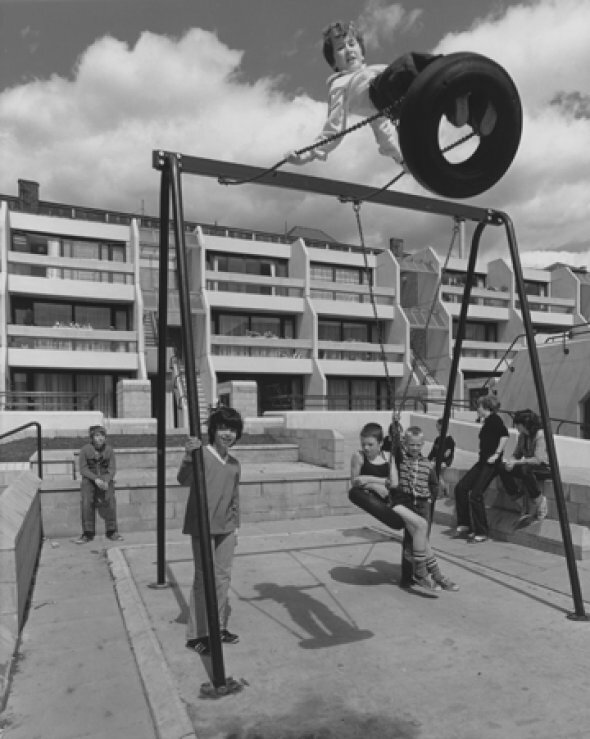 It reflects also – and perhaps unfashionably in discussions around the architecture of council housing – on how these affect those for whom this housing was intended whose needs (as the latest round of ‘regeneration’ shows even more strongly) are often marginal to the talk and decisions which take place. Camden’s Highgate New Town redevelopment, begun in the late sixties and completed in 1981 by which time the door had slammed on such municipal dreams, offers as fine a case study of council housing’s fickle fashions as you could wish for. Follow me on this three-part journey. 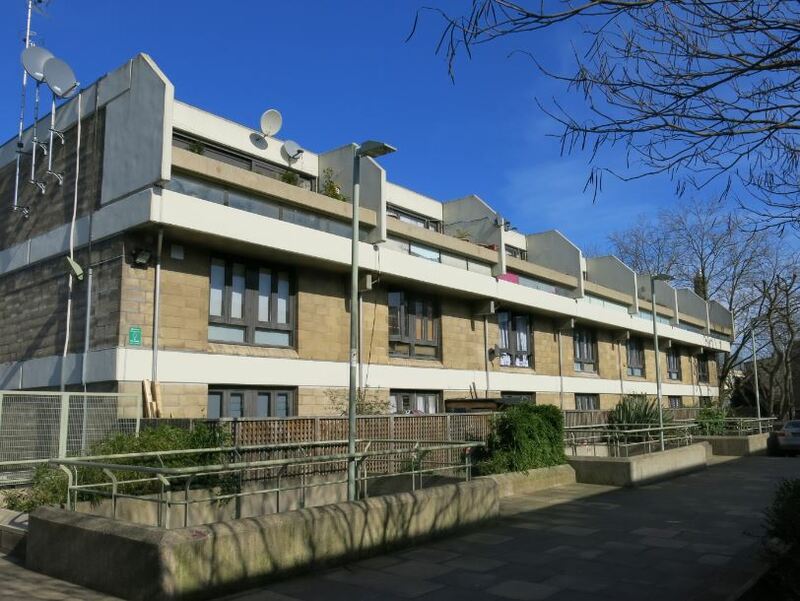 Camden itself was becoming ‘trendy’ in the sixties and the new council formed in 1965 made the most of this – it was a (predominantly) Labour borough with the style, ambition and the rateable value to build council housing of the highest quality. 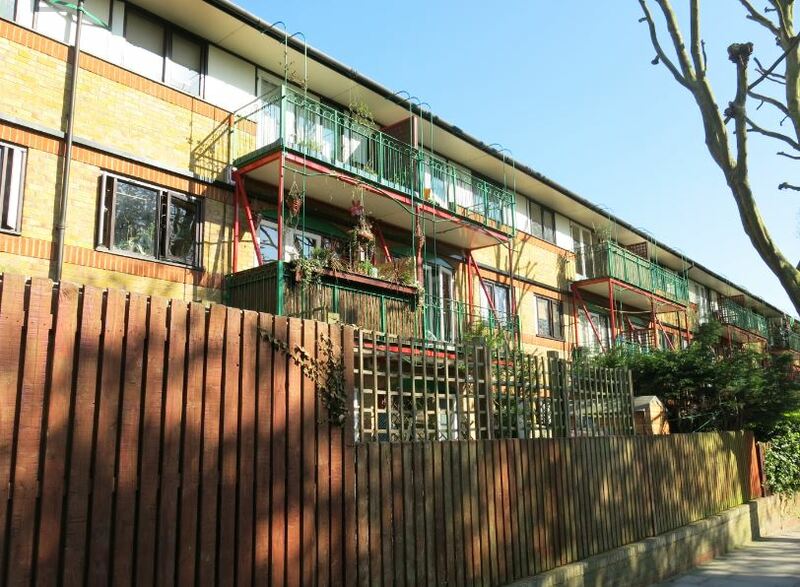 We’ve looked at its fine Alexandra Road and Branch Hill Estates already and today we examine another of its flagship schemes, the Whittington Estate. We’ll see that aim or, at least, that strategy questioned later but it’s worth remembering just how substandard those homes were and how far superior in space and facilities the local authority homes which replaced them. The old terraces were seen as unhealthy and monotonous and those who moved out generally felt little affection for the world they left behind. 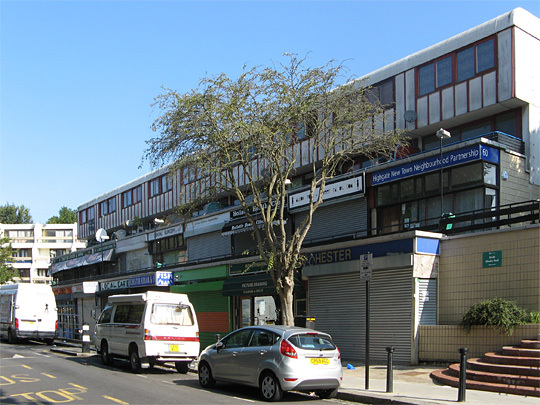 Camden’s planning of Stage One of the redevelopment scheme – what became the Whittington Estate – began in 1968. The collapse of Ronan Point, a system-built tower block, in May that year had provided a final impetus to the increasing opposition to high-rise but, in this, Camden was ahead of the game. the linear stepped-section block…A form of housing was sought which related more closely to the existing urban fabric than the slab and tower blocks, and which brought more dwellings close to the ground. 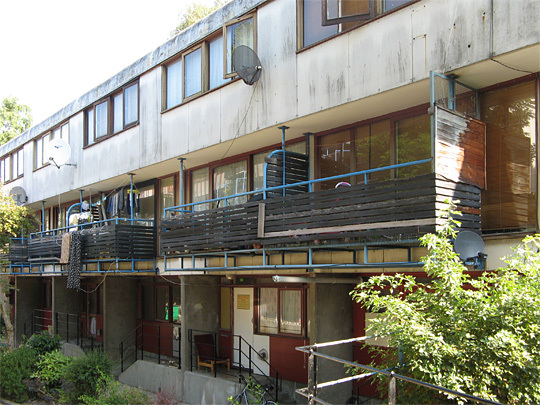 The Estate’s pre-cast concrete construction and dark-stained timber are also typical features of the Camden housing schemes of the era. The design emerged, almost unbelievably, from the diploma project of a young Hungarian architect, Peter Tábori, then in his mid-twenties. So impressed was Camden Borough Architect, Sydney Cook, with the project that he commissioned Tábori to design the final scheme. 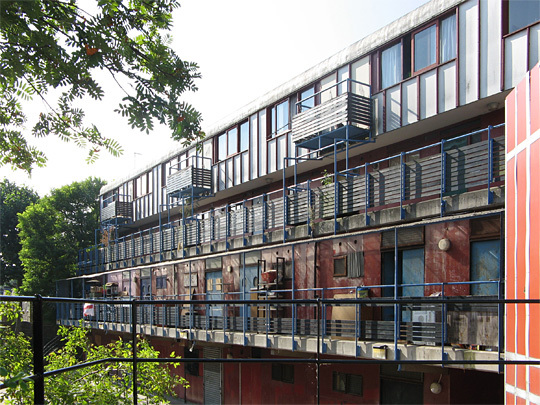 The Whittington Estate comprises six parallel terraces – 271 dwellings housing around 1100, ranging from one-bed flats to six-bed houses – enclosing four pedestrian streets. The bare description does little to capture the scheme’s attractiveness, firstly the intimacy of scale achieved by its thoughtful use of a sloping site. Then there are the terraces which are varied in form and broken up by staggered throughways to ensure each has a distinct character and appearance; the green spaces and play areas between them; and finally, the more informal planting which provides a greenery that obliterates any starkness that could linger in the Estate’s design. If this is Brutalism, it’s very domesticated. The individual homes, each with their own directly-accessed front door, received similar attention. Kitchens were placed to overlook the pedestrian walkways and allow supervision of children, anticipating the current vogue for what is called ‘the natural surveillance of the streets’. All homes had a south-facing outdoor space – a balcony or terrace – and in dwellings of more than one floor living space was generally placed at an upper level to maximise internal light – glazed walls separated the living room from the terraces. For all the good intentions, the actual construction of the Estate was plagued with problems. Building began in 1972 and was scheduled for completion in 1974. The original contractors had problems with the scheme’s precast concrete panels and went bust in 1976. Construction defects then required elements of the scheme built to date to be demolished and rebuilt. In all, the Estate cost over £9m to build – well over twice the original estimate – and wasn’t finished until 1979. The practical difficulties encountered in Stage 1 were a major factor in the decision to embark on a very different design for the second phase of redevelopment south of Raydon Street. Changing tastes were another. It is difficult not to question the policy of building housing “estates”, “areas”, “schemes” isolating one use from the more natural and spontaneous surrounding areas…I wonder how long it will be before the next generation will be appalled by the enormous acreage, albeit low-rise, of housing developments, self-contained within themselves with standard pedestrian decks, coloured front doors, toddler play areas, estate supermarkets and community centres which are the utopias of the local authorities. Not long was the answer. Written in 1973, this was an early anticipation of current wisdom – a wholesale rejection of the council estate model rooted in nostalgia for traditional streetscapes and the community which they (allegedly) fostered. There’s much to unpick here – not least the romanticised notions of earlier housing forms and the disingenuous assumption that market-driven decisions (determined by class, relative power and wealth) are somehow innocent or ‘natural’. But it reflects thinking that became the norm and was – without hyperbole – seismic in impact, not just on council housing but on the wider economy. When planning is the enemy and the unfettered free market an ally, we open the door to the inequality and exploitation, the greed and division, which so mark contemporary society. That politicians and planners made mistakes goes without saying, of course, some recognised in the very thinking which inspired the Whittington Estate. Elsewhere, however, even as the Highgate scheme took off, reconditioning of older properties was becoming the vogue, not least in Camden itself where the Council’s wholesale purchase and refurbishment of such homes preserved many for working-class occupation. (6) Elsewhere in London these properties are now the des res’s of the middle-class, unaffordable to all but the most well-heeled. 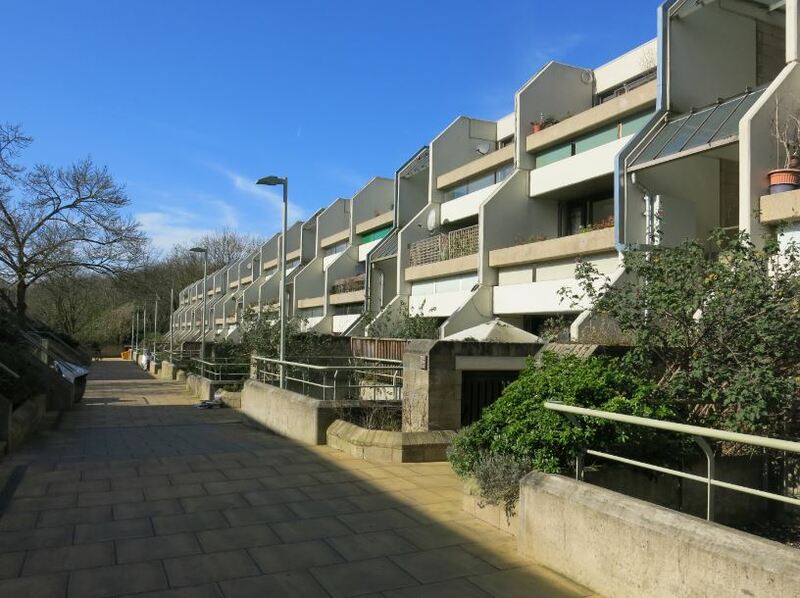 We’ll follow the continuing story of the Whittington Estate next week and look at the very different housing built in Stage Two of the Highgate New Town development – a continuing study in the contexts and trends that have shaped our social housing and, as importantly, our perceptions of it. As housing emerges as a major election issue, it’s salutary to look to the past and examine some of the earliest debates and issues around social housing – and dispiriting to realise how little we have learnt. 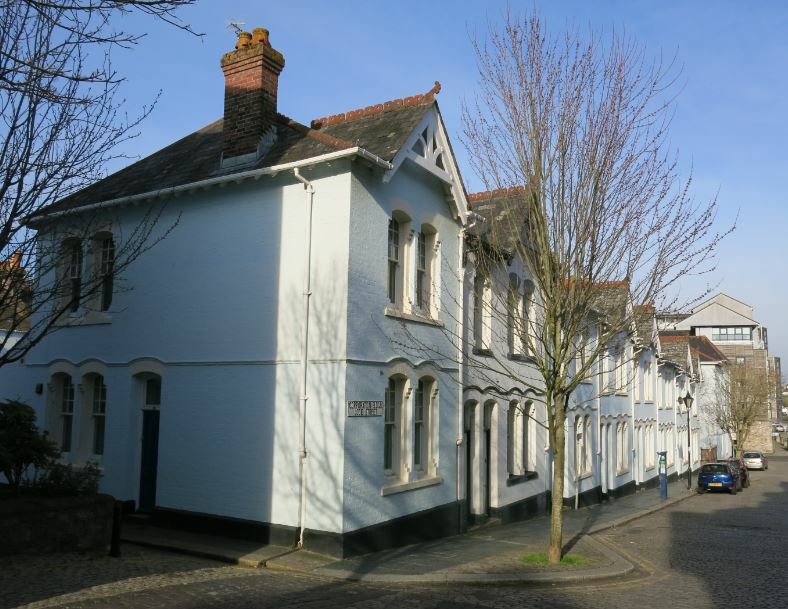 This post looks at the first council housing built in Plymouth after the public duty to ensure decent housing for all was recognised in the 1890 Housing of the Working Classes Act. Much has changed since the worst days of Victorian slumdom but a closer look reveals some uncomfortable echoes with present-day problems and our continuing failure to fulfil that duty recognised – however falteringly – over one hundred years ago. In the nineteenth century, Plymouth’s population was among the worst housed in the country. The first half of the century had seen three major cholera outbreaks and an epidemic of smallpox struck as late as 1872. The Corporation was slow to act – only adopting the 1848 Public Health Act six years after its enactment under pressure from the Board of Health. Perhaps those problems of failures of land utilisation, housing shortage and inflated rents sound familiar. At this time, Plymouth was one of the Three Towns (alongside Devonport and Stonehouse) and had become a county borough only in 1888. The new Corporation was to be more ambitious that its predecessors however, embarking – in 1895 – on its first municipal housing on land acquired on the town’s eastern outskirts at Prince Rock. The Laira Bridge Road estate, comprising initially 104 flats and houses with accommodation for 824, opened one year later. Solid, attractive housing, the estate makes it into Pevsner which describes it as ‘red-brick with timbered gables, a conscious adaptation of the English vernacular idiom’. (3) Streets named after the members of the Housing Committee can be seen as an example of civic pride or personal self-aggrandisement according to taste. 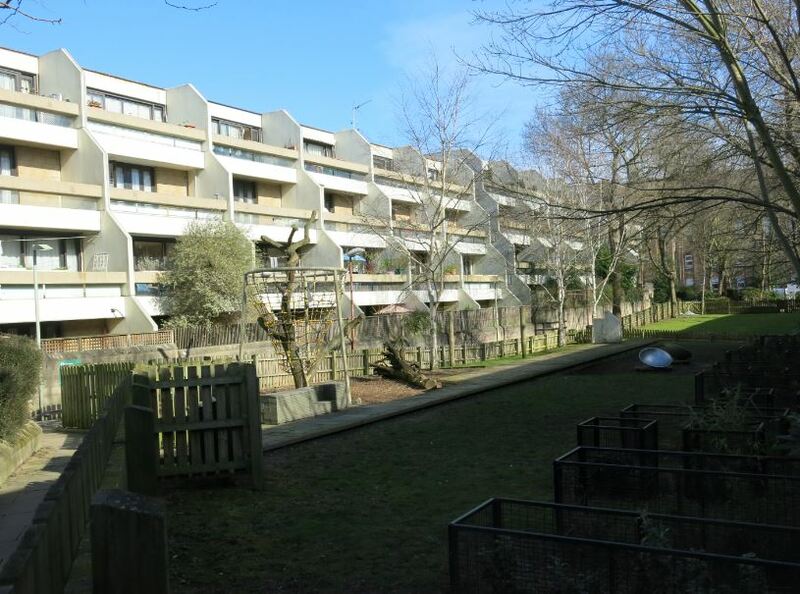 The estate was intended, in part, to rehouse those displaced by the Corporation’s other major pre-war scheme – a significant slum clearance project in the Barbican area, the town’s historic core. Seventy houses in Looe Street and How Street were demolished, affecting a population of some 813. 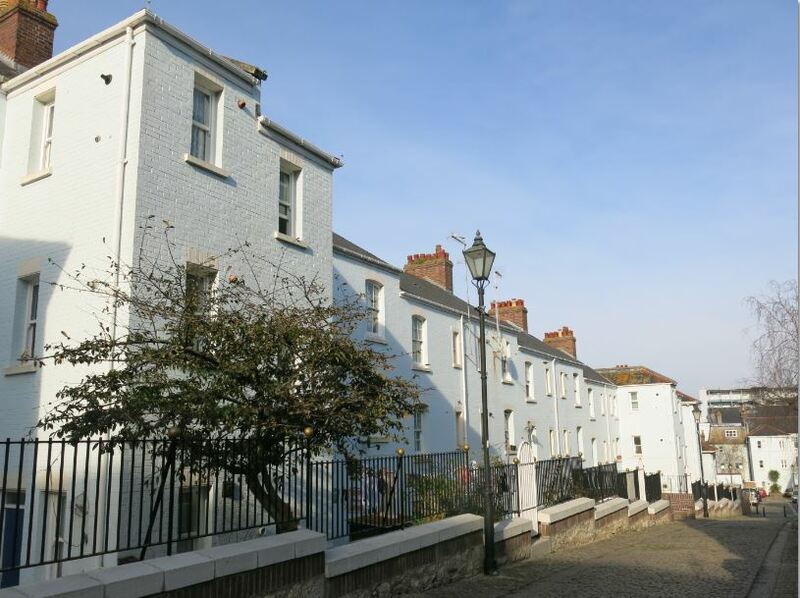 The first housing was built on the northerly side of Looe Street – a three-storey slate-roofed terrace of painted brick, concrete floors and staircases and wooden sash windows at the top of the street and a more elaborate, two-storeyed, timber-gabled further down – before 1900. How Street, adjacent, was completed in similar style. The rents in both schemes were described as ‘high as against the wages of the tenants’ but ‘generally low as compared with the figure which could be obtained in open competitive market’ – figures ranged from 4s a week for the cheapest two-room flat to 8s a week for the most expensive four-roomed houses. The occupations of the tenants may be described as those mainly of labourers, fishermen, and people of miscellaneous and more or less uncertain occupation. The distinct artisan class is almost entirely absent. 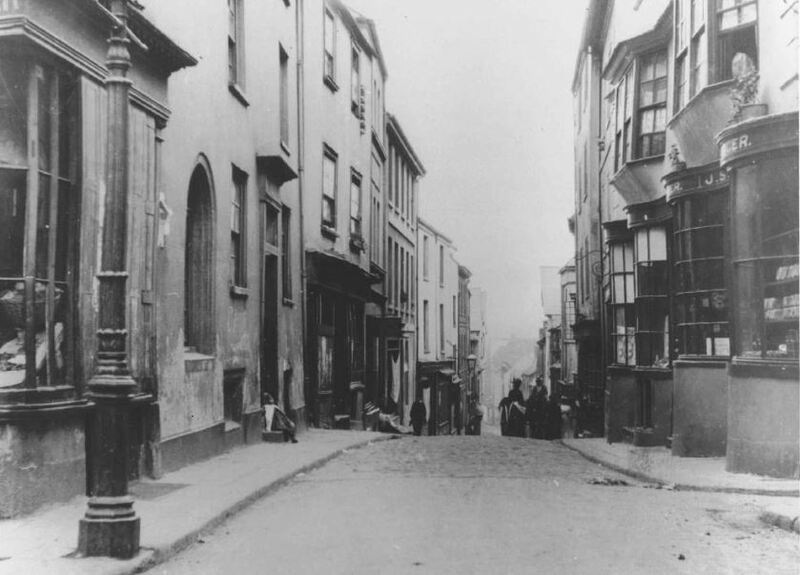 Over one third of the Prince Rock tenants were said to come from the former slums of Looe Street and How Street and most of the others were ‘from the same congested district…and of the same class’. If this was the case – and there seems to be some attempt to put a positive spin on things – this represented an unusually successful attempt to rehouse an inner-city slum population in Corporation housing. It may seem surprising, therefore, that the Housing Committee also concluded that it couldn’t ‘recommend the wholesale clearance of sites in this manner again, except in extreme urgency’. This brings us to the vexed question of finance. Plymouth had incurred heavy debts in its programme of municipal enterprise – some resulting from the short thirty-year loans offered by the Local Government Board and some from bank loans. It was also accused of using earmarked loans for alternative purposes. As a result, it had been made subject to restrictions on its borrowing. (6) A private parliamentary act in 1904 regularised its position but required the Corporation undergo external audit. The Committee had already felt itself compelled to sell off part of its building land at Prince Rock and build ‘housing of a less costly type’ in its central scheme. 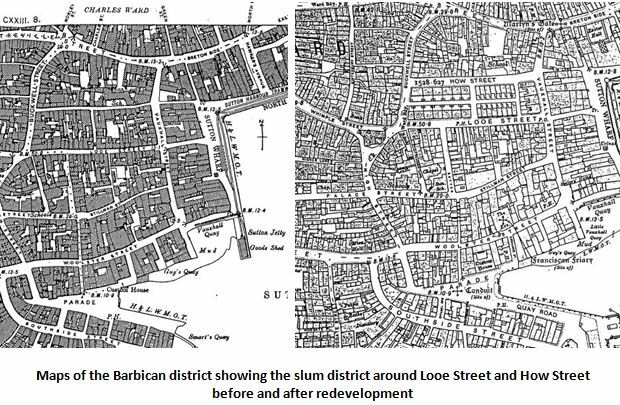 Its efforts at this point were concentrated on building tramways (to disperse an overcrowded population) and compelling repairs to existing slum properties. 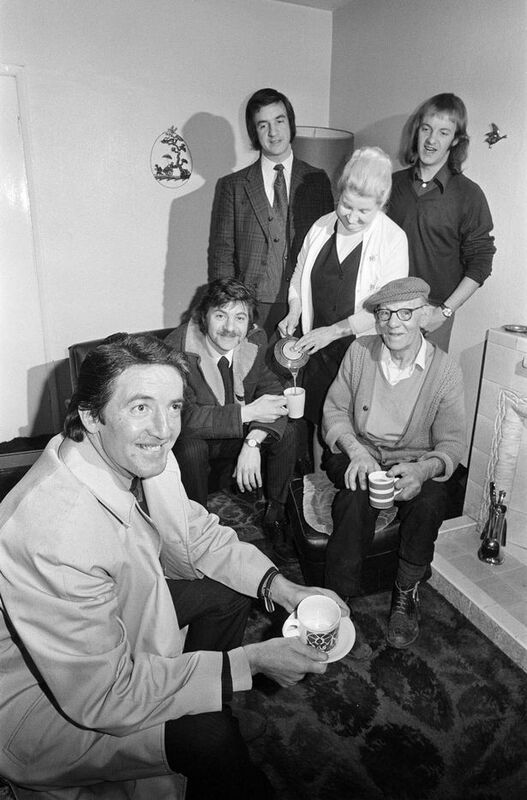 Even under the restrictive terms offered by the Local Government Board, it was clear (as the Corporation argued) that its housing schemes were virtually self-financing – 1d on the rates met the immediate demand to service debt – and would be fully paid for within thirty years. There is nothing new, therefore, in the financial short-termism which prevents councils borrowing to invest in much-needed housing or the crude fiscal calculus which proclaims the cost of everything but disregards the value – personal, societal, even economic – of investment in social infrastructure. It’s good to see the Council recognising and maintaining this heritage. Nor is there anything new in the housing protest which results. 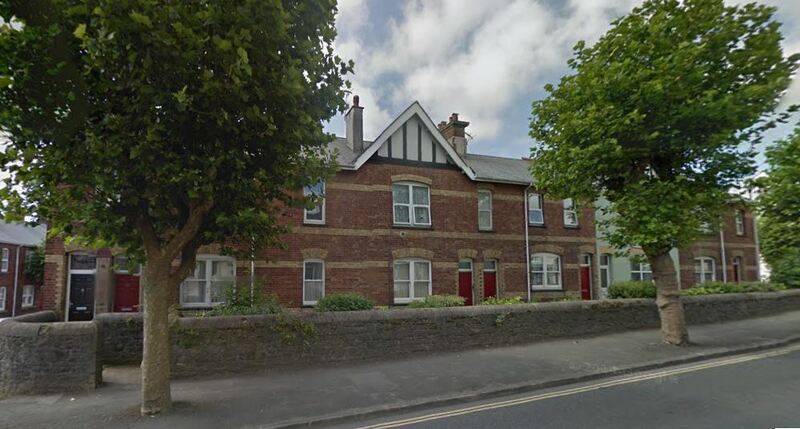 In March 1900, the Plymouth branch of the Social Democratic Federation convened a meeting to establish the Three Towns Association for the Better Housing of the Working Classes. Despite the left-wing politics of the Federation, it ‘hoped that the matter would be considered from an entirely non-political and non-sectarian point of view’ and the party worked hard to forge an inclusive, populist alliance. The origins and dynamics of the current Homes for Britain campaign are a little different but reflect, at least, the belief that the need for good quality housing for all should be a unifying rather than divisive issue. The refinement and worthy character which a love of home develops are impracticable to large numbers of people in ‘the merry homes of England’…. If the people were all heroes or angels of perfection they would, of course, surmount all obstacles, and keep themselves perfectly clean; but as they are only human there are some who, discouraged by the disabilities which a grinding capitalist system has imposed upon them, fall into dirty habits. It’s an argument couched to appeal to those who would denigrate our poorest citizens but it remains a lesson that the makers of Benefits Street and its ilk might profitably benefit from. cater for the thousands who would never be in a position to purchase a house. Who, he asked had been paying the interest on the land? Why the poor members, of whom there are hundreds waiting an opportunity to get a decent house to reside in, and here was a chance to help them. As former philanthropic housing trusts and many housing associations across the country are looking to make money from selling off what they own or building homes for sale to the wealthy, this also has an uncannily modern ring. Finally, there was the question of what social housing – council housing at this time – should be built. By 1906 the Corporation had rehoused a little under 1500 of a population (in 1901) of 107,000 and it embarked belatedly on another housing scheme in Prince Rock. 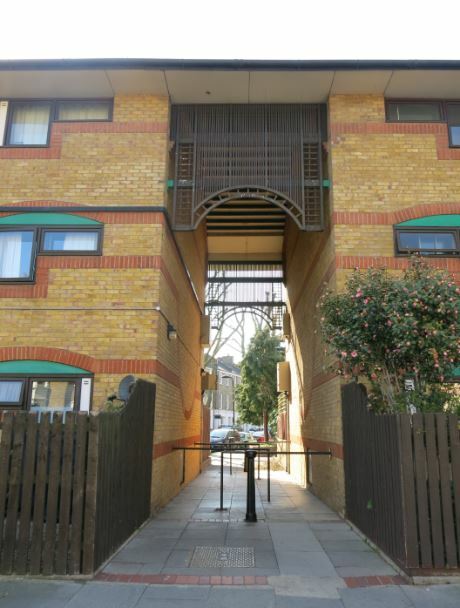 A reminder, if we need it, that social housing tenants should never be second-class citizens, excluded from shared space, required to use ‘poor doors’, deprived of the light and views enjoyed by their better-off fellow citizens or – simply – in any way treated as inferior. There’s nothing new under the housing sun. 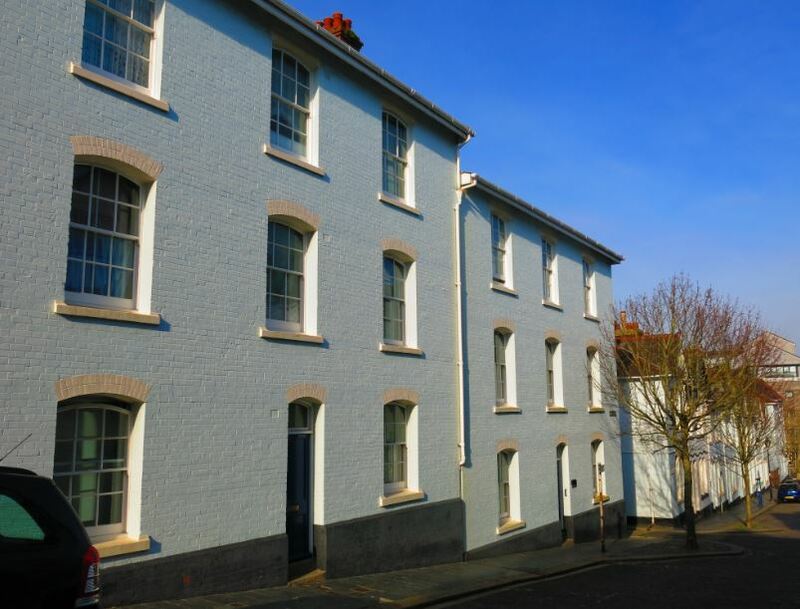 The moral, social and economic case for high quality and genuinely affordable social housing remains as compelling now as it was in turn-of-the-century Plymouth. Please support it in this election. (1) The quotation – and other detail here – is drawn from Crispin Gill, Plymouth: a New History (1993). The 1902 figures come from ‘The Housing Problem at Plymouth’, Western Daily Press, Bristol, 11 December 1902. (5) Mortality statistics are from William Thompson, Housing Up-to-Date (1907), the quotation from the Western Daily Press article cited. (7) AT Grindley, ‘The Warrens of the Poor’, Three Towns Association for the Better Housing of the Working Classes (1906) quoted in Hilson, ‘Working-Class Politics in Plymouth, c1890-1920’. Other quotations which follow are drawn from the same source. My thanks to Ann Bond for providing advice and detail for this post. Ann will know better than me the errors and omissions that remain. After 1945, St Pancras Borough Council built more council housing than any comparable London borough. That achievement looked unlikely in the early years of local administration which saw St Pancras dubbed ‘the foulest parish in all London’ but by 1914 the Borough, against initial resistance, had built the foundations of a housing record second to none. To begin with, that resistance: the pre-reform St Pancras Vestry – which ruled locally until 1900 – was slow to respond to problems of slum housing among the worst in London, so bad that even the Prince of Wales urged reform after an incognito visit to one particularly notorious district. St Pancras Vestry, 1874. The map is oriented south on left to north (with Hampstead Heath) on right. Approximate locations marked for (A) Prospect Terrace, (B) Flaxman Terrace, (C) Goldington Buildings. Click on the map for an enlarged view. Prospect Terrace, an area of poor Irish settlement, just to the east of Gray’s Inn Road, was the particular focus of concern – an area (almost uniquely in London) of back-to-back housing, with death rates twice the capital’s average. It was nicknamed – for reasons which are unclear but certainly not complimentary – Cat’s Meat Square. A contemporary newspaper comment that the ‘Cockney Irish…seem to have the dirty habits of the Irish and the English added together’ was more revealing of upper class callousness than of the hard lives lived by their poorest compatriots. Slowly and reluctantly the Vestry did respond. In 1896, it proposed its own scheme to clear Prospect Terrace – and Bantome Place to the east – and erect municipal housing on site. 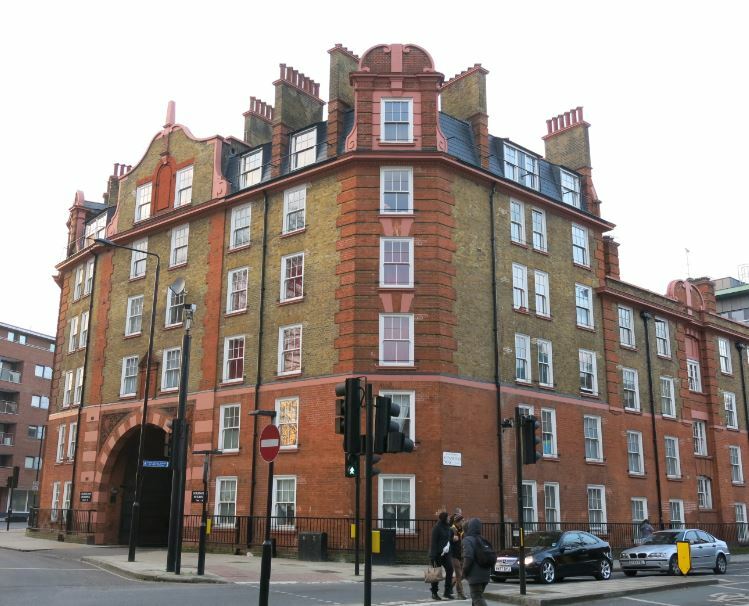 Belatedly, in 1898, it also agreed to build a new tenement block to the north (at the intersection of Great College Street and St Pancras Way) intended, in principle, to rehouse a greater number of the 1500 people to be displaced. The Vestry’s response remained dilatory, however. 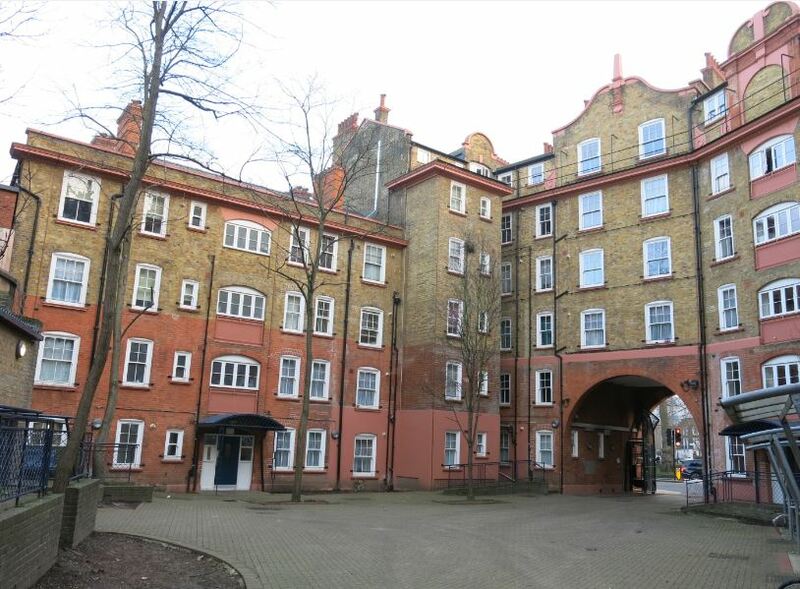 When John Burns, the Lib-Lab MP, visited Prospect Terrace two years later he could still declare it worse than the Shoreditch area: in St Pancras ‘a new element was growing up: men who were living on women – the lowest of the low’. In the event, it was the Vestry’s successor, the St Pancras Metropolitan Borough Council – still predominantly a Conservative body – formed in 1900, which would complete these projects. It resolved to construct its new northern tenement block first. 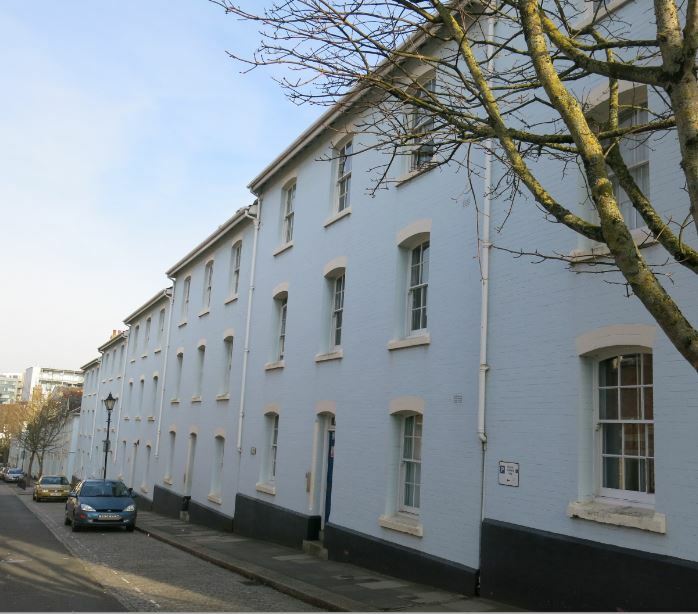 Internally, it was far better accommodation than that which it replaced but it was basic – comprising 56 dwellings, mostly three-room tenements containing WCs, sculleries and coppers for hot water but no baths. But though ‘housing for the working classes’ (as its foundation stone states), its rents were too high for most of the displaced slum-dwellers. Cheaper two-room flats let more readily but the three-room (at between 9s 6d and 11s 6d a week) were affordable only to the better-off. (3) Indeed one of the earliest residents, William Neave, was a commercial traveller and his daughter a short-hand typist…until she became better known (and renamed) as Ethel le Neve, Dr Crippen’s mistress. Since then Goldington Court (also renamed) has been modernised several times over to suit higher standards and changing times. Most of the flats, but not all, had baths by 1935. A major 1964 refurbishment replaced that now ‘dreary asphalt courtyard’ with a garden and increased the number of one-bed flats. 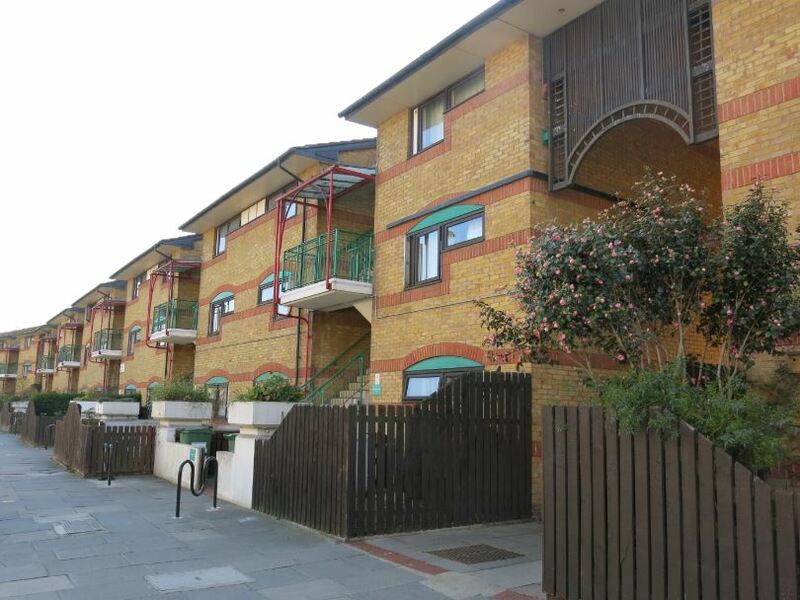 Now managed by Origin Housing, the most recent (£3.9m) renovation in 2011 increased the number of larger family-size flats: 21 of the 30 current flats are three-bedroom. All that, I guess, is a tribute to the sturdiness of the original construction and the resilience and adaptability of social housing. Six storeys with much consciously pretty detail: roughcast top floor, domed corner towers and Art Nouveau railings. It’s the Grade II-listed caretaker’s lodge, later transformed into tenants’ meeting rooms and currently being renovated once more, which is perhaps most striking. The flats themselves were adapted in 1964 and again in the mid-1980s (from 85 flats to 48) to provide the larger accommodation then in demand. 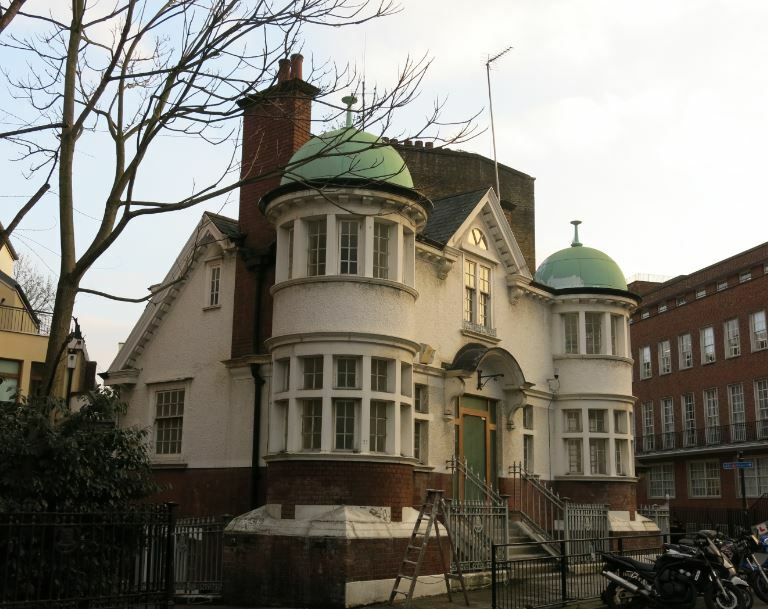 In 1906, almost twenty years after its demolition had first been mooted, and against the protests of residents who lacked alternative accommodation, Prospect Place was cleared. 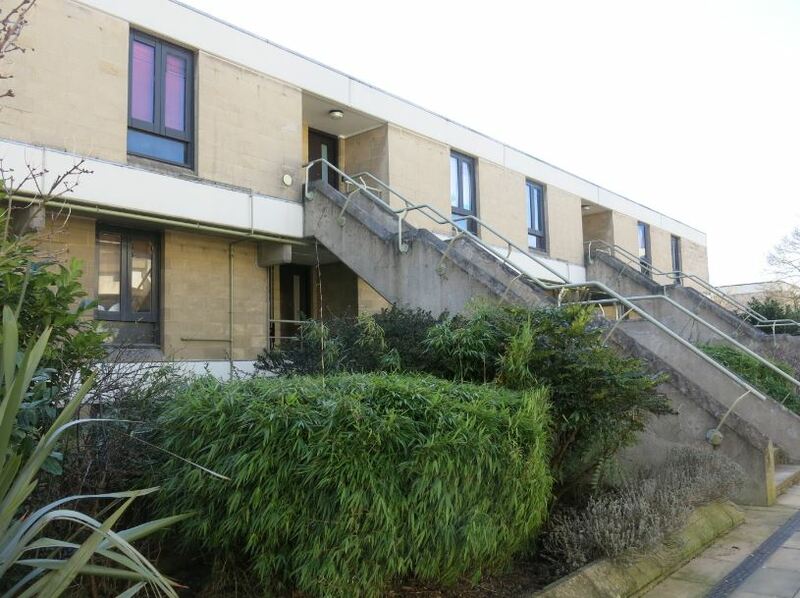 Its replacement, also designed by Joseph and Smithem, contained 34 two-bed and 36 three-bed flats and a shared bathhouse made available (at 2d or 4d a time including soap and towels) to other local residents. fitted up with a washing trough and an independent copper for washing clothes, a larder, dresser, coal bunk, a small gas cooking range, and also an improved form of range. By lifting up a shutter in the middle of this range the fire can be transferred into the living room which adjoins the scullery, so that the tenants need only light one fire, which will serve for cooking and heating purposes. Bedrooms contained ‘a dress cupboard with shelves and pegs for hanging clothes’ and the buildings lit with ‘incandescent gas’. although they would not be able to take in the submerged tenth which were cleared out of them, of course a better class of working men and women would take them, and the others would be able to take their places. This notion of ‘filtering up’ was common to advocates of council housing at this time but its practicality is debateable. Most of those displaced in fact moved to slum housing in the adjacent streets or to another area of very poor housing just to the north in Somers Town. The new Prospect Terrace did not survive, destroyed by German bombs during the Blitz on the night of October 15/16, 1940. Thirty-two residents lost their lives and the buildings were rased. 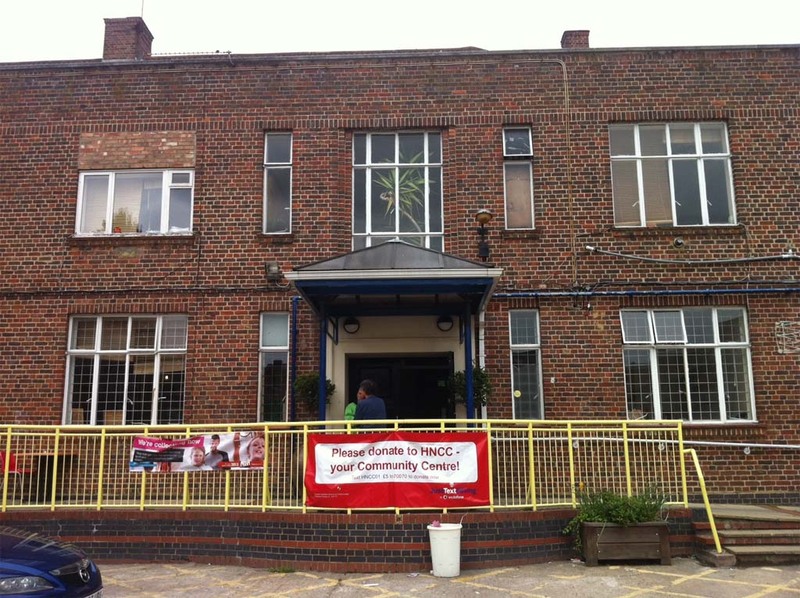 After the War, the LCC took over the land for its Kingsway College which occupies the site presently. 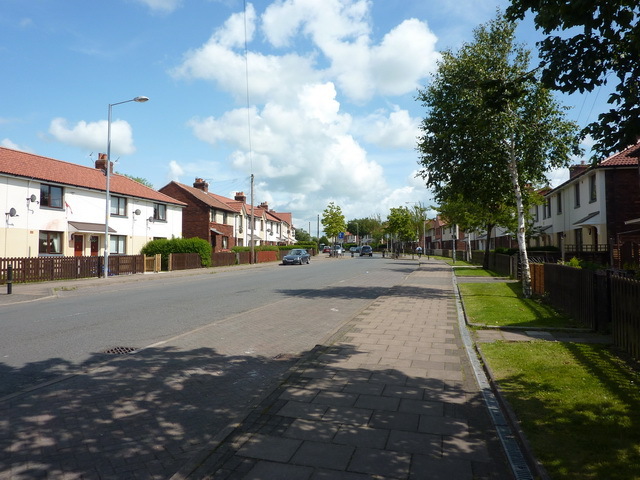 The Council had built 210 dwellings by 1914 – a not discreditable total in an era when so little council housing was being built but, as is evident, much remained to be done. That work would be tackled by more energetic councillors in the years to come when the responsibility of the local and national state to secure the decent housing of its people would be better recognised. 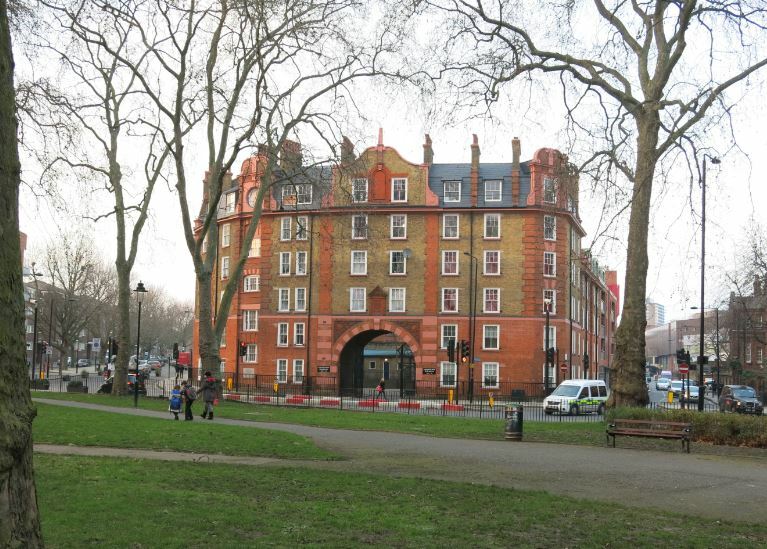 These early years, however, provide a contrast and context for a later period when St Pancras – and its successor authority, Camden – would be among the leading housing providers in the country. (1) Stephen W Job, Cat’s Meat Square. Housing and Public Health in South St Pancras 1810-1910, Camden History Society (2012). Other detail and later quotations, where not otherwise credited, come from the same source. 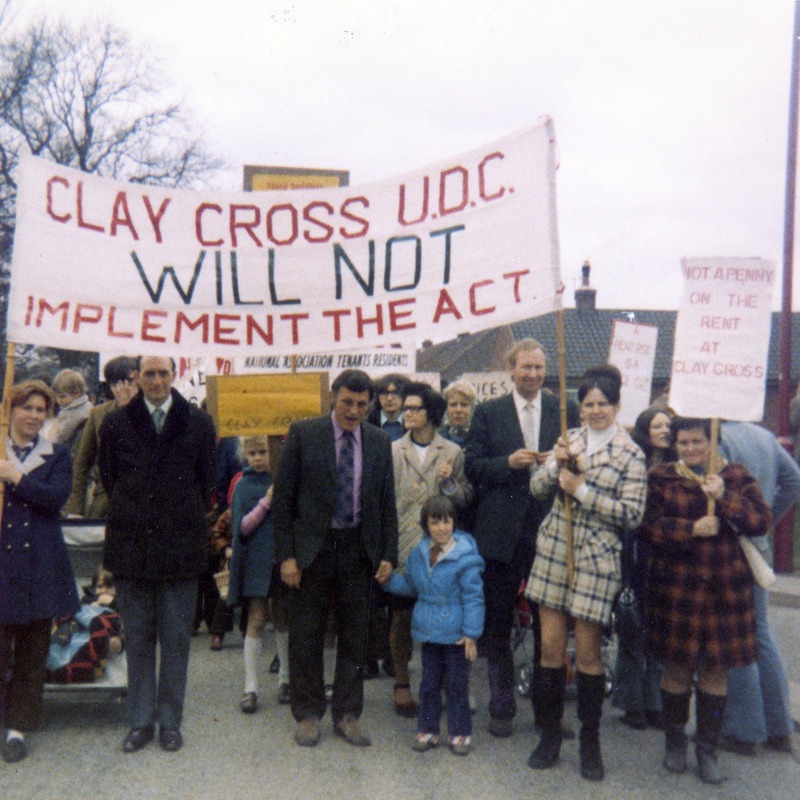 Last week’s post looked at the history of Clay Cross – its longer-term politics as well as the commitment to working-class interests and record of practical achievement of its new Labour council elected in 1963. This post examines how housing and rents became central to that struggle and why its 1972 Rents Rebellion has been such a unique episode in Labour and local government history. 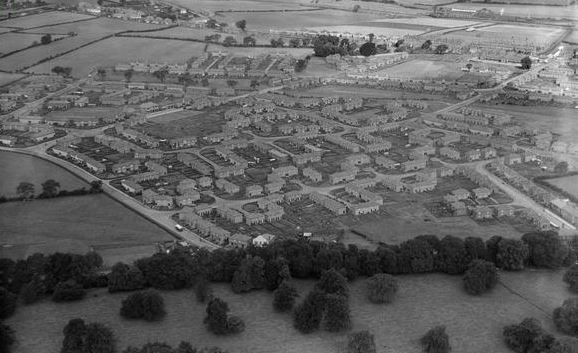 Before 1979, housing was seen as local government’s most important role and here Clay Cross acted boldly. 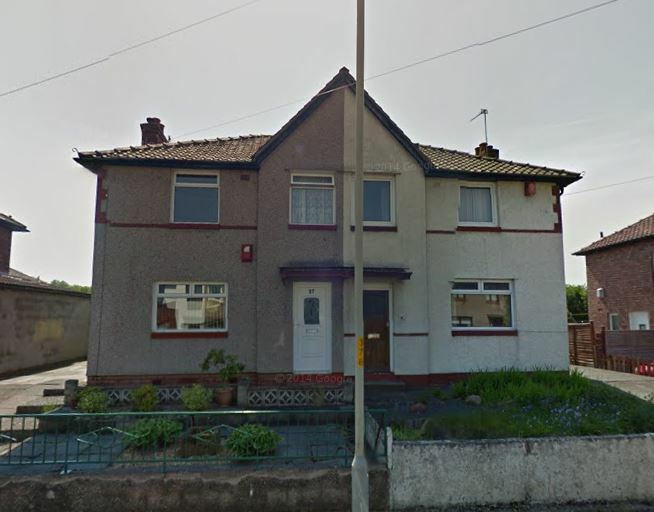 The Council had been quietly buying up the town’s substandard houses for some time, demolishing them or making them fit for purpose as appropriate. By 1971, over 550 slums had been cleared, 95 per cent of the total. On this Council we like to think of ourselves as basic Socialists. We regard housing here as a social service, not as something the private sector can profit from. Two hundred homes were transferred from the National Coal Board that year. The Urban District, with a population a little under 10,000, had 1340 council homes, housing around half its population. At this point, the Council’s rents – at £1 12s including rates – were the lowest in the country. Arrears were not pursued through the courts but by a personal visit from the chair and vice-chair of the Housing Committee. Often they found tenants not claiming the benefits to which they were entitled and the policy proved effective as well as humane. The ultimate test of these principles came with the passing of the Conservative Government’s Housing Finance Act in July 1972. At a time when unemployment in the town stood at around 20 per cent, the legislation required the Council to raise rents by £1 a week. In September, the Council formally resolved to reject all provisions of the new law. That stance was overwhelmingly endorsed by local voters in the Council elections which followed and backed up by a rent strike called in 1973 supported by 84 per cent of tenants. When Mr Skillington – the hapless Housing Commissioner sent in by Whitehall to collect the increased rents – arrived from Henley-on-Thames he faced complete non-cooperation, refused office space and staff. He withdrew a few months later having failed to collect a penny of the increase. But the law pursued its course more inexorably. 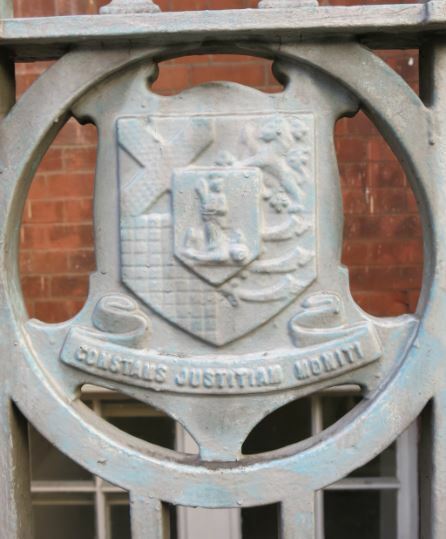 In July 1973, the courts found Clay Cross’s eleven councillors– Arthur Wellon, Charlie Bunting, Graham Smith, Eileen Wholey, George Goodfellow, Terry Asher, David Nuttall, David Percival, Roy Booker, David Skinner and Graham Skinner; working men and women, good trades unionists – guilty of ‘negligence and misconduct’ and they were fined a total of £6,985 plus £2,000 costs. We have one judge, not those three in there; that’s our conscience and our conscience is clear. The eleven were disqualified from office and personally surcharged and new elections ordered. 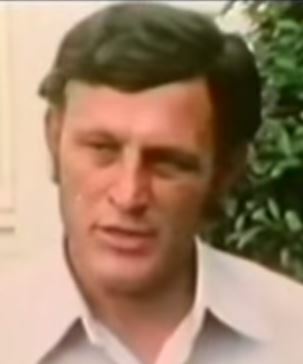 In the by-elections which followed in February, 1974, a 71.5 per cent turn-out returned ten of a ‘second eleven’ of Labour candidates pledged to pursue resistance; the other lost by just two votes. Of 46 councils initially refusing to implement the Act, Clay Cross had been the only one to maintain its opposition to the bitter end – as Graham Skinner says, ultimately ‘a futile gesture’ but a necessary one. In answer to the question ‘why Clay Cross?’, I hope I have provided some answers here. This was a distinct and close-knit town; some outsiders even call it isolated though I’m sure that’s not a local perception. 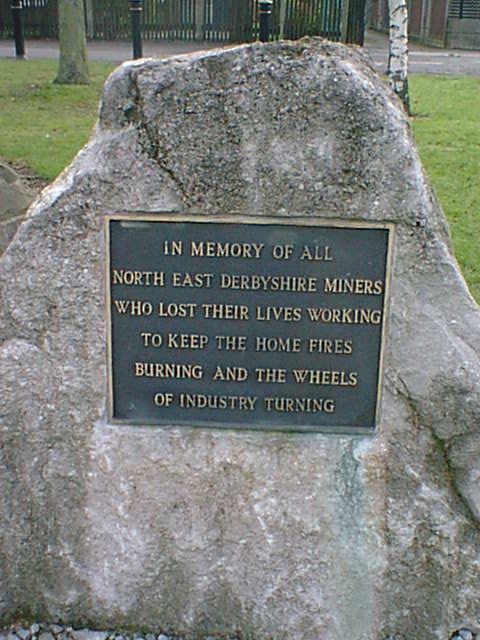 Its mining and manufacturing heritage runs deep – a history of hardship and resistance, of trades unionism and working-class politics rooted deep in its community. The men and women who were elected to serve on the council were not remote figures who did what the bureaucrats told them to do, but representatives of the working people of the town who kept faith with their electors. It was as simple as that. All this, of course, is hard to replicate: unusual enough then and another world now as, from the 80s, we have witnessed working-class communities up and down the country ravaged by de-industrialisation and mass unemployment and the collateral damage these have wrought. The days of steady, secure employment and strong trade unions forthright in its defence seem distant; the possibility of work and politics as proud and progressive badges of local identity long gone; a simple respect for working people (and for those, through no fault of their own, without work) as the backbone of our nation disappeared, sometimes derided. And, to prevent this becoming a pointless exercise in sepia-tinted nostalgia, let’s acknowledge positive changes too – more people better educated, new opportunities and higher living standards for some (even as many of those advances have ground to a halt in recent years). 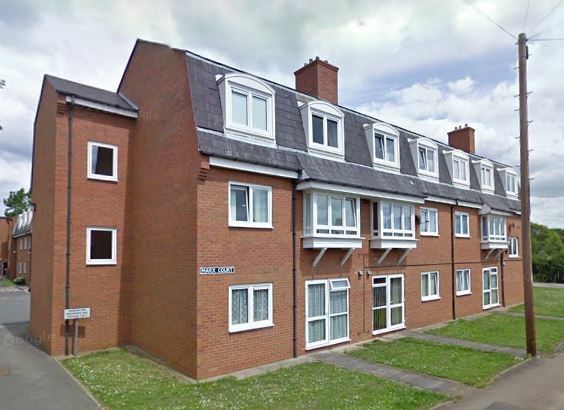 Marx Court, Clay Cross, housing for older people, opened by North East Derbyshire District Council in 1982: a nod to a radical past? At any rate, Clay Cross will be hard to repeat. But it does hold lessons. I don’t knock councillors, nor am I cynical about the energy and good intentions they generally bring to their work but Labour councils have become too willing to work with the contemporary grain of neo-liberal politics, scrapping within its interstices to wrest such small progressive victories as it allows. This is seen most powerfully in the housing field where a proud council housing legacy is being squandered and ‘regeneration’ has become a tool to destroy communities in order to build ‘affordable’ homes which are nothing of the kind. There remains a lesson from Clay Cross, not of an old politics but of a renewed politics where politicians are not technocratic figures managing the agenda of the day but true representatives of their communities spearheading a politics from below – a politics of, from and for the extraordinary ‘ordinary’ people who constitute the mass of our country. I don’t think for one bloody minute we are heroes. I think we are doing our job – and that’s to help the working class, the cream of the nation. 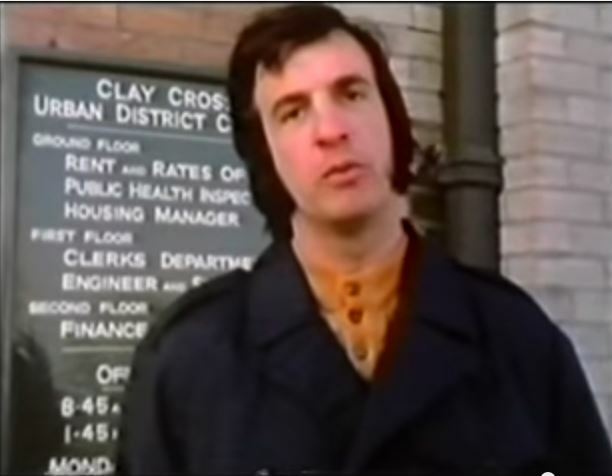 The 1974 ITV documentary Confrontation at Clay Cross is on YouTube. For more on the Clay Cross Rents Rebellion, the best source is the book by David Skinner and Julia Langdon. Online accounts can be found on the Dronfield Blather blog and, from a more revolutionary perspective, ‘How Clay Cross Fought the Tories‘ on the website of the Socialist Party. Neil Barnett, ‘Local Government and the local state; from crisis to crisis’, a paper for the panel Austerity, the Local State and Public Services at the PSA Annual Conference, 2013 also tackles the question of why Clay Cross’s resistance has proved so unique. Clay Cross takes its place – alongside Poplar – as a hallowed place in the Labour pantheon: a site of struggle and resistance, a town where a Labour-led council fought valiantly for its people, whose socialism was less an abstract ideal than part of its living fabric. All that came to a head in the famous 1972 Rents Rebellion. But it was rooted in a history, community and politics of much longer vintage. This post will look at that at that longer story and try to answer the question why there, why then – and, by extension, why not here and why not now. In the early nineteenth century Clay Cross was little more than a hamlet at a crossroads. A cross stood at the intersection of Clay Lane and Thanet Street and from that it is said to have derived its name. But its history begins in 1837 when George Stephenson drove a tunnel under the village and discovered iron and steel in the process. Stephenson set up a company to exploit its potential which, after his death in 1848, became the Clay Cross Company. 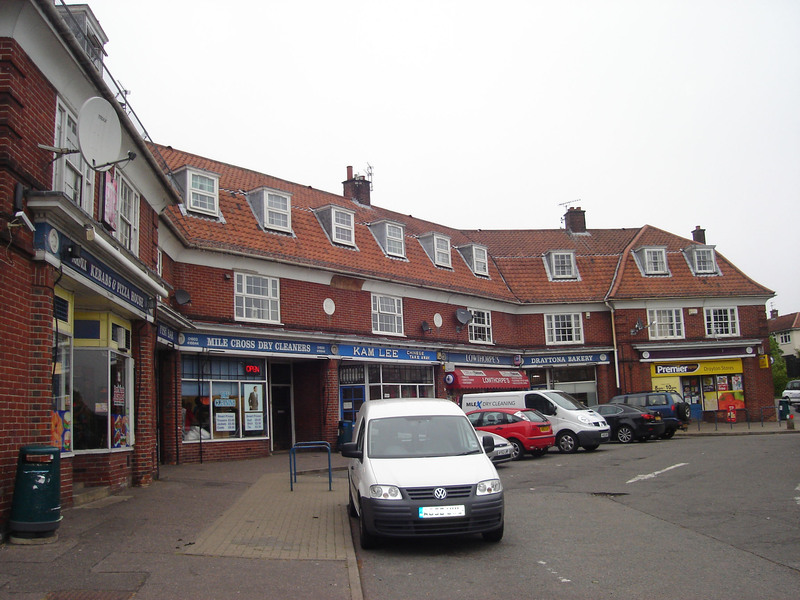 The population of Clay Cross itself had tripled – to 1478 by 1841. It was a company town and the Clay Cross Company was said to be a paternalistic employer, generous even – its workers’ housing comprised four rooms rather than the two which were typical. In the mining industry, that paternalism didn’t amount to much. In November 1882, an explosion of firedamp in the town’s Parkhouse No. 7 pit killed 45 men and boys. An inquest jury, comprised of the local middle classes, found no negligence on the part of the Company but recommended that safety lamps be used in future. It naturally also expressed its ‘deep sympathy with all the bereaved ones who had suffered in this calamity’. Sympathy, however, was in short supply during the Great Lock-out of 1893 when local miners – resisting a 25 per cent wage cut – were laid off for nine months. Nor was it evident in 1910 when John Renshaw led the colliers of Parkhouse in a 14-week strike against the pittance paid for abnormal work. Renshaw was dismissed; his comrades bought him a hawker’s cart so he could somehow continue to make a living. Politically, resistance was also stirring. Labour representatives held a majority on the Clay Cross Urban District Council from its formation in 1894 to 1906. 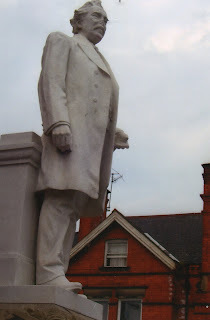 James Haslam, Clay Cross-born in 1842 and Secretary of the Derbyshire Miners’ Association, was elected as the local MP in 1906 and became its Labour MP when the Miners’ Federation of Great Britain affiliated to the party in 1909. In 1919, John Renshaw, now described as a greengrocer, was elected a Labour councillor. There was much to do. Although, by 1919, some of the worst slums had been demolished, some back-to-backs knocked through, a small municipal scheme had been built in Broadleys, of 1800 houses in the town only 130 had baths and only 500 had WCs. 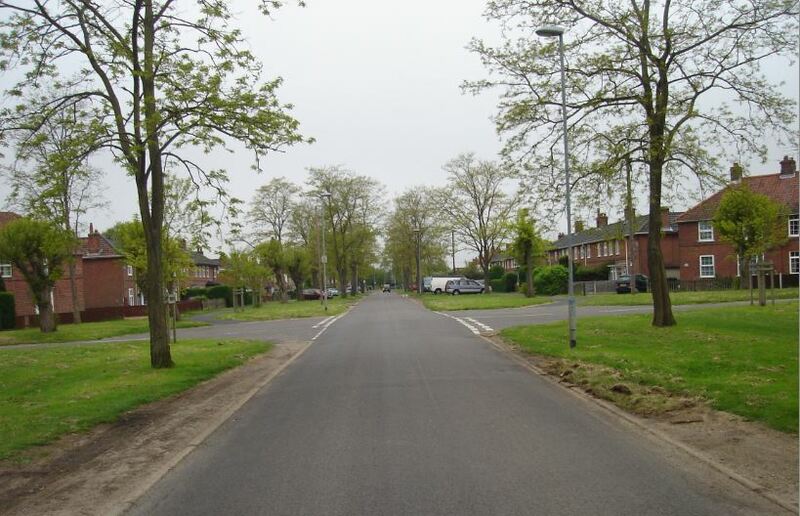 (2) The Council responded by purchasing an additional five acres of land for a £57,000 scheme to extend its Broadleys estate. If Capitalism has found some easier and better method of investing money other than building houses, then it must devolve itself upon the State and local authorities to provide them and give the working classes that share of comfort which should be theirs by right in a Christian country. As slum clearance took off in the mid-1930s, 63 houses were demolished under the 1930 Housing Act, displacing 229 people, and 14 houses built in Holmgate Road for some of those displaced. One year later, in 1936, plans were announced for the construction of 64 houses and 14 bungalows for elderly people on the newly-acquired Angel Fields site. 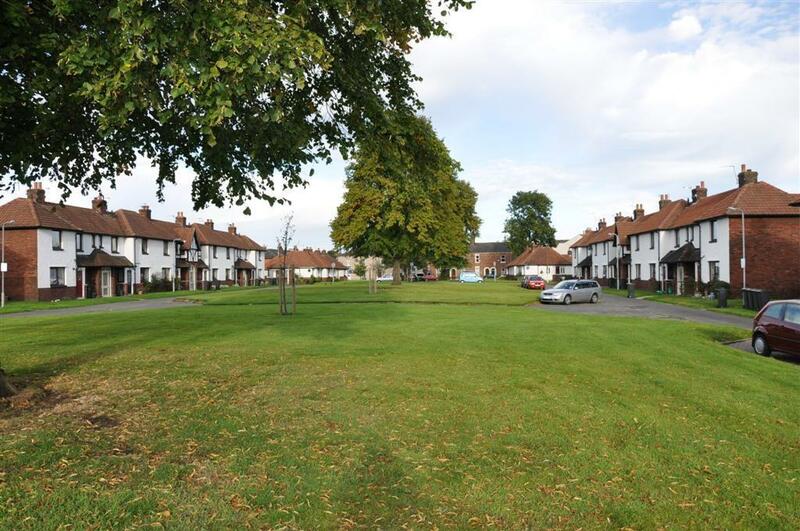 Thirty new houses would be built on the Estate after 1945 and by 1950 the Council had completed 290 new homes in all. 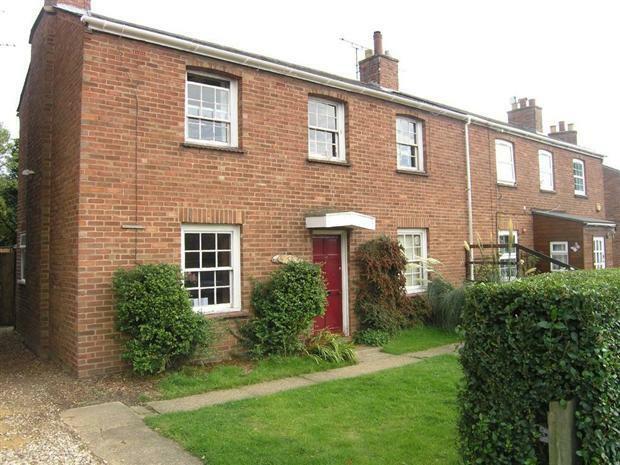 Much very poor property remained – Elbow Row was a terrace of one-up, one-down houses with ‘blind backs’, ‘improved’ in 1960 by the Clay Cross Company by the addition of a single-brick lean-to at the rear. (6) It was demolished in 1973 at the height of the Council’s ambition and radicalism. This later chapter begins in 1960 when Dennis Skinner (brought up in a council semi on Meadow Lane, Holmgate) was elected to the Council. Local Labour, it is said, had grown moribund in the 1950s when Skinner and others, less celebrated, revived the party. Three years later, in 1963, Labour took all eleven seats on the Council and it would win every contest thereafter until 1974. The council as a unit was strong because it had developed its policies as an expression of the will of the people it served. It knew those policies were right because of the growing political awareness in the town, because it was clear that people had learned to care what happened there, because – unlike in many local authority areas – between 65 and 75 per cent of them bothered to turn out and vote whenever there were elections. This wasn’t the stuff of revolution. 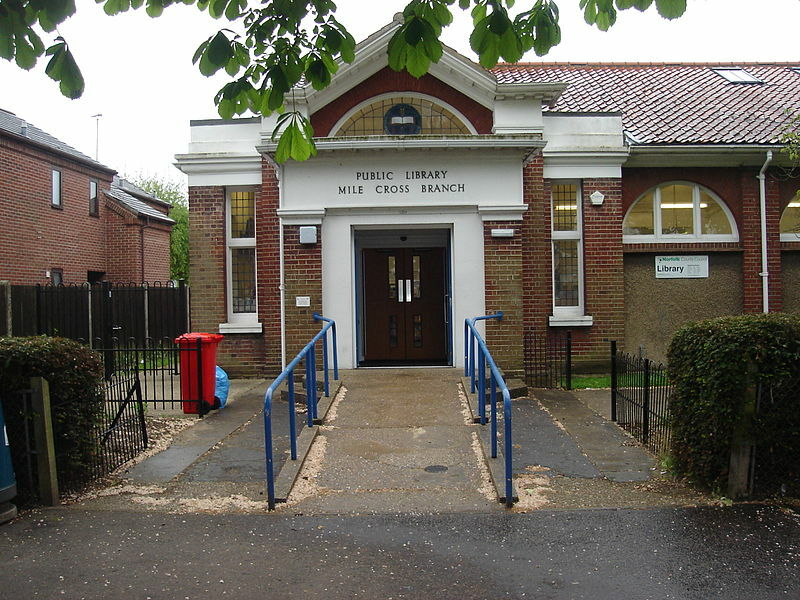 For example, three ‘Darby and Joan Clubs’ were opened in the 1960s for the town’s senior citizens who were also (alongside those with disabilities) given free bus travel in 1971 and free TV licences in 1973. When Margaret Thatcher abolished free school milk in 1973, the Council kept supplying its primary school children through a penny rate and the diversion of an increased chairman’s allowance. It ran playgroups too and provided (with some help from the Sports Council) a brand-new Olympic-sized swimming pool to replace the near-obsolete one at the Miners’ Welfare and a pitch-and-putt course on a former slag heap. The opening of new council offices in an old building, a former hotel, on the town’s High Street was a deliberate symbol of the Council’s place at the heart of its community. When Dennis Skinner performed the opening ceremony in July 1965 he declared that the public ‘will be the openers of the new offices. If public service is presented properly, the people will take an interest.’ (8) And they did. 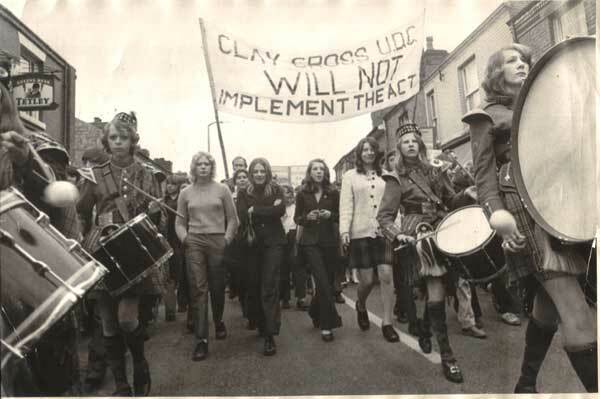 We’ll follow this story to its climax in the famous rents rebellion of 1972 in next week’s post and attempt to understand why Clay Cross has been so unique and distinct in its resistance to unjust laws and a hostile politics. Norwich, contrary to the county town image that some may have of it (though that too was true), was a densely-settled, industrial city which came under Labour control in 1933. The Council built over 7500 houses in the 1920s and 30s (twice the number of new private homes built in the same period) and rehoused some 30,000 people – almost a quarter of the population. 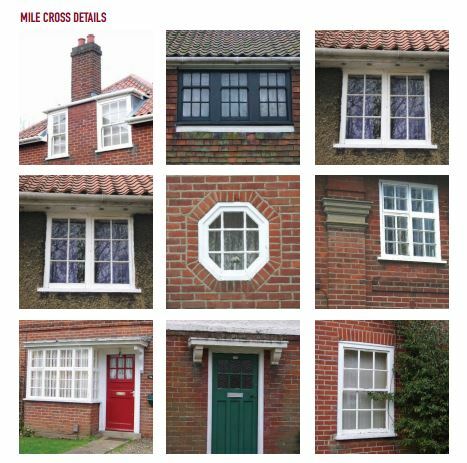 Mile Cross was the finest of its new estates. knowing nothing about the city except that it has always made money, that it was once the third city in England, that when its weaving trade went north after the coalfields, Norwich just put on a flinty face and learned how to make women’s shoes. small dwellings in scattered areas spread over the city, mostly within the old city walls. Many…are timber-framed, and therefore difficult to condemn as regards structural stability, but…they are lacking in light and air, and are damp, and deficient as regards sanitation. But as James Bullough (the City Engineer), continued, ‘for the first time the public conscience had been awakened to the necessity of providing adequate living accommodation for all’ and the City Council determined to build 1200 new houses, 300 of these on 102 acres of farmland and brickfield purchased for £10,600 just west of the Aylsham Road – the future Mile Cross Estate. Not only that but the Corporation appointed SD Adshead (the leading contemporary figure in council house design and layout whose work we have seen in Stepney and Brighton) as consultant. Adshead himself appointed four well-known local architects – Stanley Wearing, George Skipper, AF Scott and SJ Livock – to design some of the new homes and planned the new scheme as a community from the outset, with schools, churches, shops, pubs and community centres. It would, naturally, be a garden suburb and with its fresh air and open space complemented by public allotments and parks. Wearing, Adshead’s chief collaborator, wrote in the Architects’ Journal of the ‘abundance of good early 19th century work in Norwich’: a style, he argued, which leant ‘itself to a simple and dignified treatment for work of this nature’. This is the neo-Georgian which typified much council house design of the period but in Norwich its good quality redbrick construction and pantile roofing give it a local, vernacular feel which is atypical. At the other extreme were the 184 standard plan ‘Dorlonco’ houses erected in this first phase. These were steel-framed homes developed by Adshead, Patrick Abercrombie and Stanley Ramsey in conjunction with the Dorman Long Company in Redcar, designed to be built on a mass scale but adaptable with a range of skins to suit local preferences. Here in Mile Cross, they reflected the double-fronted neo-Georgian style of the estate’s other early homes but are marked out by their lower-quality brick and slate roofs. Over fifty types of houses have been planned, giving variety in accommodation and design, which has prevented the Corporation housing estates from becoming stereotyped in monotonous rows of dwellings, a contrast to the dreary view of similarly designed dwellings of pre-war days presenting a wearisome drabness all too familiar to us all over the whole country. You’ll see this in the range of building materials employed at Mile Cross although most of the 148 concrete block houses and six all-steel houses have since been demolished. 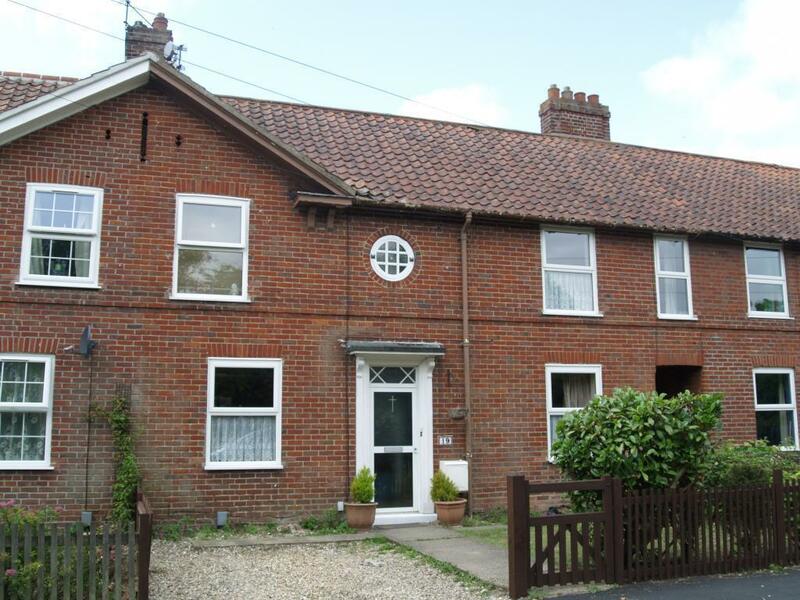 There was some effort to incorporate the arts and crafts aesthetic of the time in the use of low eaves, roughcast rendering, hanging tiles and mock timber framing but in Norfolk they do different and, as the Norwich conservationists point out, this was a vernacular derived from Kent and Sussex rather than East Anglia. Alongside all this, community facilities followed relatively quickly – the first infants’ school in 1926 (and primary and secondary schools in due order), the Drayton Road shops in 1928, the local library in 1931 and the striking St Catherine’s Church in 1936. 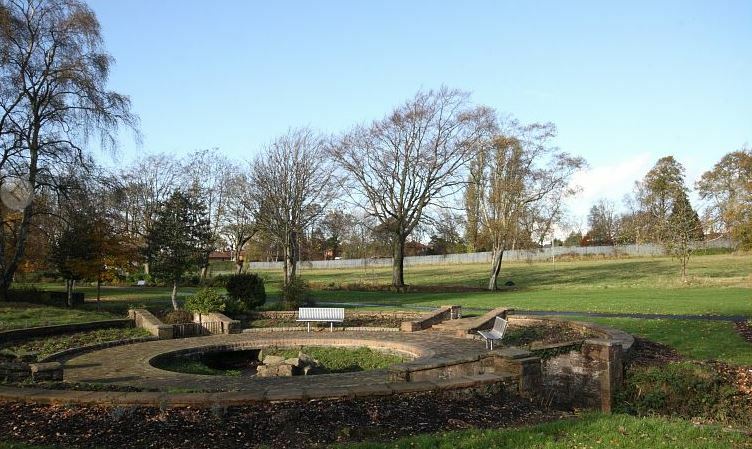 The one-acre (grade II listed) Mile Cross Gardens, designed by Adshead and executed by the estimable City Parks Superintendent Captain Sandys-Winsch, were opened in 1929, their construction – and particularly their concrete shelters – used to give work to the city’s unemployed. 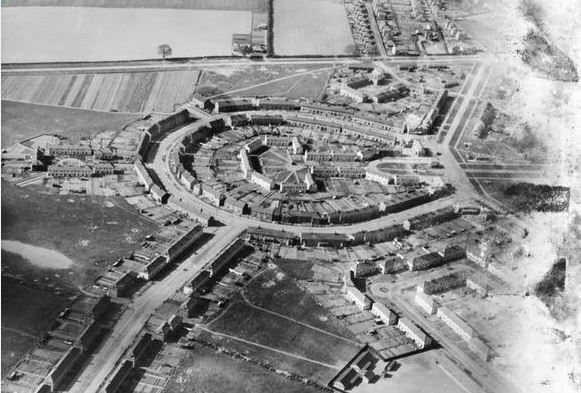 By 1932, the Mile Cross Estate comprised around 1400 council homes, two-fifths of the city’s total. (4) The city had been eighth among county boroughs in its rate of construction under the 1924 Housing Act and would open its 5000th council home in 1935. Large estates also grew in Earlham and Lakenham. By this time, greater attention was being given to slum clearance. In the city centre areas of Pitt Street and Coslany Street, 3238 houses were cleared displacing a population of some 9873. (5) The Housing Committee gave its attention to attention to the construction of flats ‘on Continental lines’. 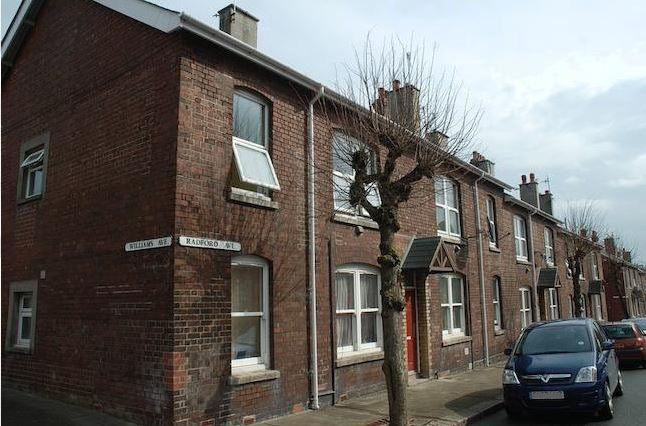 The three-storey flats on Barrack Street were erected in 1936. The city, a Labour stronghold from 1933 to 2000, would continue to be on the ball – a prodigious and innovative builder of housing for its people. In the early days, as was typical, these Corporation tenants were vetted for their ability to pay. The first tenants included a few shoe operatives but also clerks, engine drivers and teachers. But the Council also stated it would give preference to ex-servicemen (or their widows) and those for whom the ’physical and moral welfare of the applicant’s family [was] being endangered under existing conditions’. The latter would be increasingly favoured as slum clearance took off. I can remember my mother saying she was the envy of her sisters because she had a bathroom. It led off the kitchen and the kitchen and bathroom had concrete floors which my mother, I can remember her doing it with red cardinal polish and that used to look quite nice, and a rug in front of her seat. Another recalls the bath of his new Mile Cross home – ‘a luxury’ even if the bath was in the kitchen and the ‘kitchens weren’t plastered or nothing’. Looking back, then, these are modest homes but the city’s acceptance of ‘the necessity of providing adequate living accommodation for all’ and seeking to do so, where possible, in some style was impressive. When Morton visited canary-breeding was the working-class hobby of the day and the local football team played at a ground called The Nest. The Canaries are still going strong – one badge of local identity, and another is council housing. At peak, around half the population lived in council housing and, despite the failure of the City Council’s attempts to resist Right to Buy in the 1980s, the proportion remains high. We’ll come back to Norwich – it’s close to my heart. (3) Norwich City Council, Mile Cross Conservation Area Appraisal (Number 12, June 2009). Much of the detail on the Estate is drawn from this excellent source. (4) JJ McLean, ‘A Fine City, Fit for Heroes?’ The Rise of Municipal Housing in Norwich, 1900-1939. An Historical Perspective (ND). Other detail on the city’s interwar housing is also drawn from this valuable account. 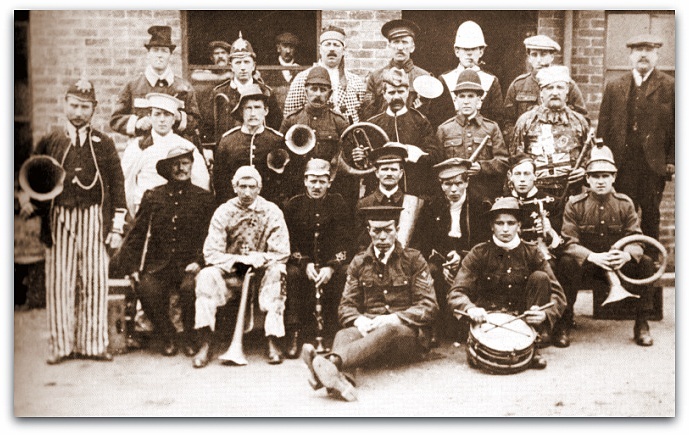 As credited, a number of the images above are taken with permission from the collection of photographs taken by George Plunkett between 1931 and 2006. 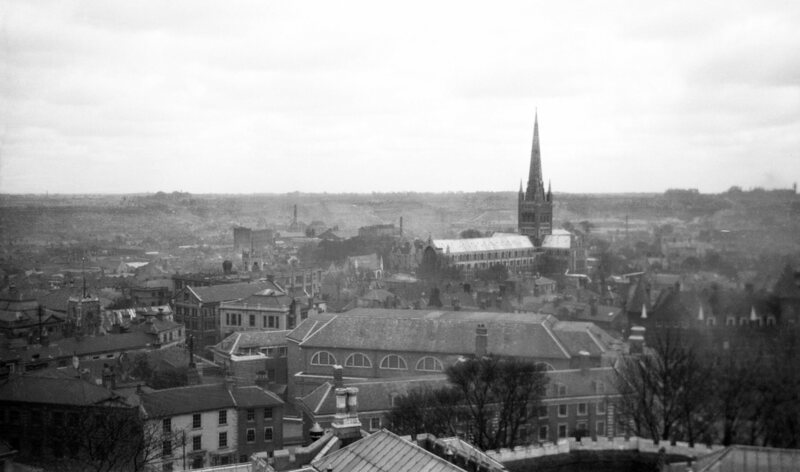 If you’re interested in Norwich (and Norfolk) past and present, do visit the wonderful website put together by his son. I was born on the 25th May 1938, in the front bedroom of a house in Orton Road, a house on the outer edge of Raffles, a council estate. I was a lucky girl. Those are the first words of Margaret Forster’s memoir, My Life in Houses. 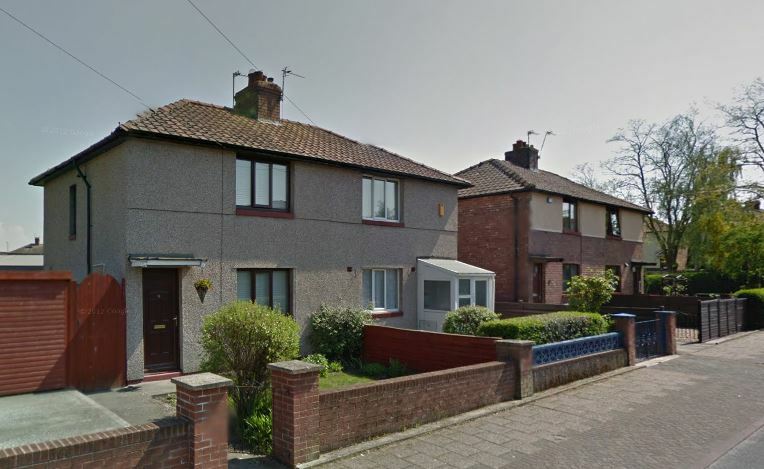 (1) Raffles wasn’t the best council estate in Carlisle but it was built well – a garden suburb, designed by City Surveyor Percy Dalton, with plentiful green space, curving streetscapes, a variety of housing forms and just 12 homes to the acre. 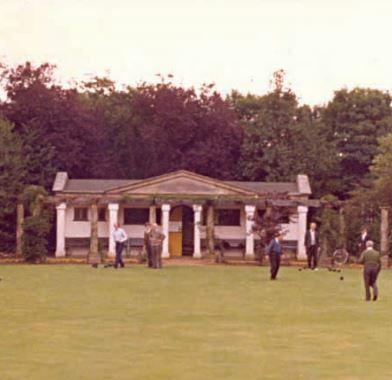 Heysham Park, opened next to the new estate in August 1934, added to that greenery and amenity with its paddling pool and miniature golf course. A new church – St Barnabas; ‘like a glistening white palace’ in Forster’s words – added some surprising exoticism. When they were nearing completion, young families would walk round Raffles on Sunday afternoon to admire the new houses and all the greenery and the new shops. 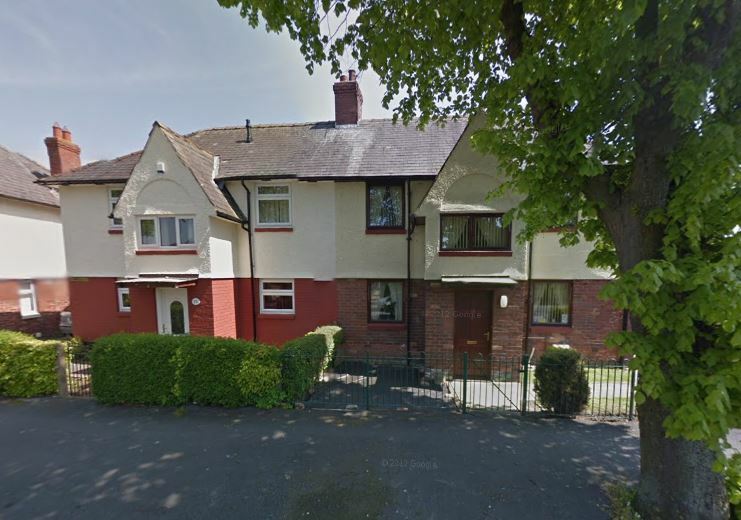 Carlisle’s finest estate, as we saw last week, was probably Longsowerby, begun under the generous provisions and high standards of the 1919 Housing Act. Construction of the Raffles Estate started in 1926. 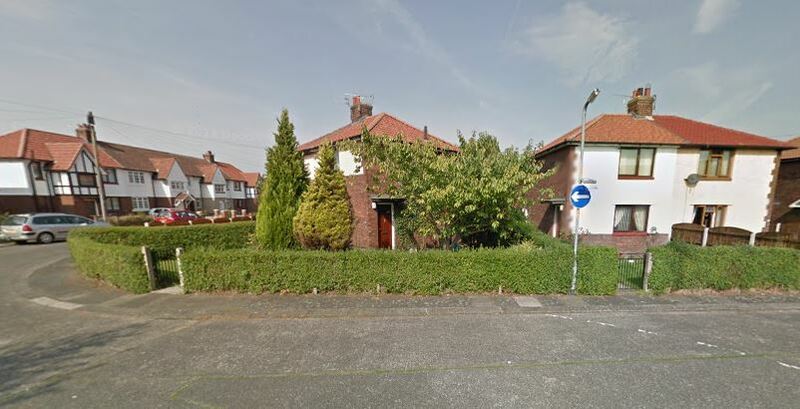 It became the city’s largest interwar estate with 1518 homes by 1939, 1200 built under Wheatley’s 1924 Act when Carlisle built more council homes than any town of its size in the country. 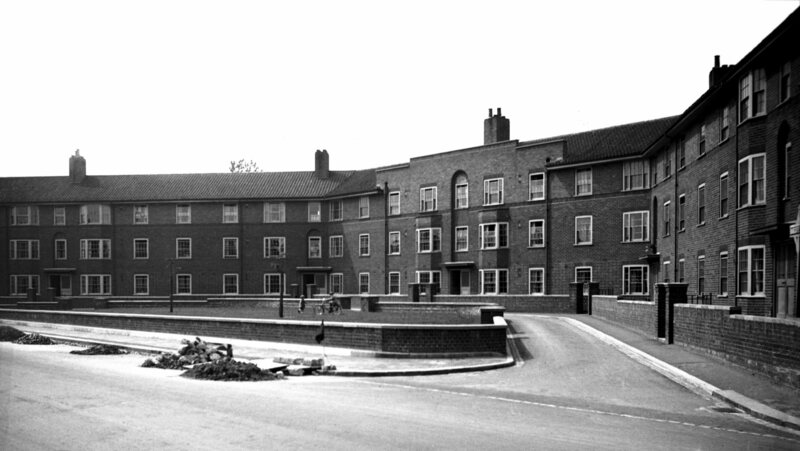 All – apart from 24 purpose-built homes for the elderly built at Partridge Place after 1936 – were two- and three-bedroom houses. Nearly all – a mark of the economy measures now in force – were non-parlour. All had bathrooms, of course, when only one in five of Carlisle’s homes enjoyed such luxury but one unwelcome innovation were toilets accessed from the back-door – not quite outside toilets as they remained part of the main fabric of the house but the inconvenience was understandably resented. One of Hunter Davies’ interviewees remembers the Estate in the 1950s as ‘a safe, pleasant and happy place’ – somewhere you left the door unlocked when you went off to Silloth (Carlisle’s seaside) for the day and a neighbour would bring in the washing if it rained. looked like a child’s drawing, and a child who had no talent for drawing. It was crude in shape, even I could see that without knowing anything about architecture. There were no distinguishing features – well, of course, there weren’t, the council’s money wouldn’t run to anything fancy. The front door, like all the other houses on the estate, was painted a dismal shade of green, not fern green, not forest green, but a withered-cabbage green. In this, there are echoes of Lynsey Hanley and her own experience of the very different Chelmsley Wood estate. Hanley’s book Estates rightly gets a good press but it’s marked by a personal alienation – the sensitive Guardian-reading teenager disliked by her peers – which comes pretty close to replicating a demonisation of ‘chavs’ her thoughtful portrayal of the travails of social housing should avoid. Forster’s own criticism of her childhood home also seems a little harsh. 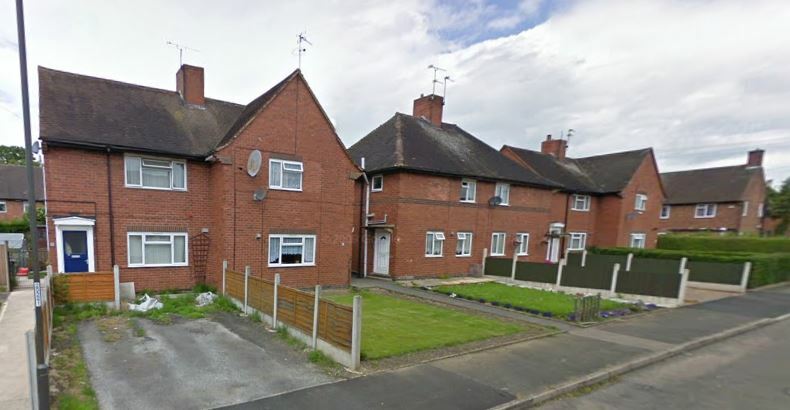 These maligned council houses look pretty good – solid, well-built, generously proportioned – when compared to the rabbit-hutch mass housing of today’s private developments. But she captures a shift – a changing perception of council housing from something looked up to to something looked down upon. It’s hard to know what else would have changed at this time. More ‘problem families’; more ‘problem families’ behaving badly? Possibly but the pre-war demographics of Raffles were pretty mixed. Nor are the alcoholism and domestic violence which Forster notes issues confined to the working class or council estates. No doubt similar phenomena existed in the posh houses but more discreetly or, to use the jargon, in a less problematised way. Council housing is seen as a viable option by fewer and fewer Carlisle residents…The continuing flow of Carlisle tenants, both actual and potential, to the owner occupied sector will result in the sector emerging as a tenure of last resort – especially for the very young, the very old and the disadvantaged…Overall demand for council housing is likely to decline in future years and this will result in the growing over-supply. At this point on the Estate itself, the void rate stood at around 30 per cent. A household survey conducted in the following year allows us a look beyond the media condemnations and popular denigrations. Two thirds of Estate households were in receipt of some form of state benefit, for almost one third this was Income Support. One in five respondents existed on a total annual income below £5000. Twenty-five per cent of households were made up of single adults, 13 per cent were single-parent families. Twenty-eight per cent of the Estate’s population were children under 16. Burglary rates were said to be five times the national average. I don’t use the phrase myself but I guess this would come close to other people’s definition of a ‘sink estate’. Let’s just say this is a large concentration of our fellow citizens living in poverty and let’s assume that many had other, less readily quantifiable, problems too. So, yes, the Raffles community was in a bad way – while still the majority lived good and decent lives, of course. There were serious attempts to improve matters. 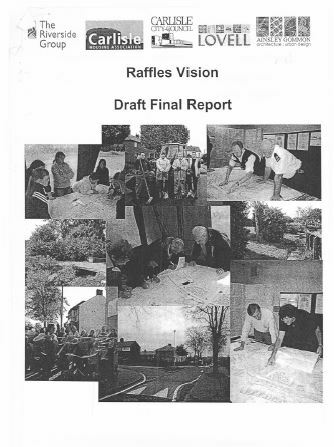 Between 1987 and 1995 Raffles received £16m of Estate Action Programme funding, mostly spent on measures to physically improve the Estate – traffic calming, landscaping, window replacements and so on. In the following three years, £3m of Single Regeneration Budget funding went on employment and training initiatives. All this, in the plaintive words of those that would regenerate the Estate, had created ‘no material change in the prosperity and stability of Raffles’. If you took an unfashionably socialist position on this, you wouldn’t be surprised that such palliative measures had failed. The next steps, however, were more radical. 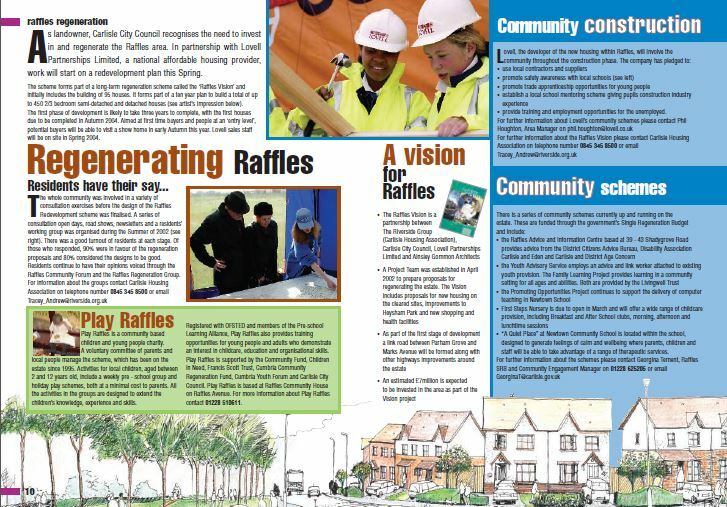 In 1999, the Raffles Area Report ‘set out a four-year programme of decanting, demolition and redevelopment’ which would reduce the number of council homes, ‘create opportunities for tenure diversification’ and allow for the Estate’s physical redesign. Almost half the council houses on the estate – 642 – were to be demolished. The other contemporary elements of this rejection of council housing and its legacy followed. In 2002, the City Council established a Project Team with its preferred regeneration partners – the Riverside Group (a housing association), the Lovell Group (a private sector development company) and Ainsley Gommon Architects. 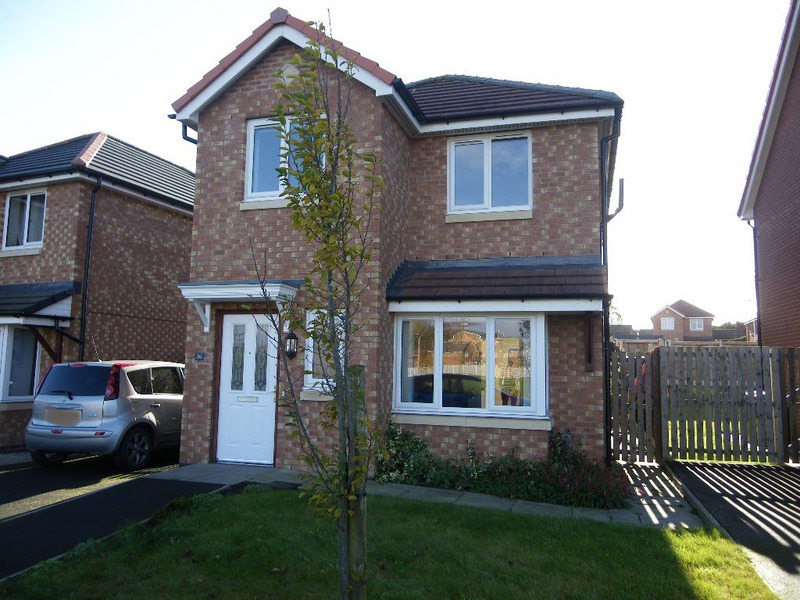 In July, Carlisle council tenants played their part – albeit by a rather narrow 52 per cent majority – by voting to accept the transfer of 7000 council homes to the Riverside Group’s local incarnation, the newly-formed Carlisle Housing Association. I’ve lived here 45 years and love it. People don’t know what they’ve got in Raffles sometimes. It’s nice now. 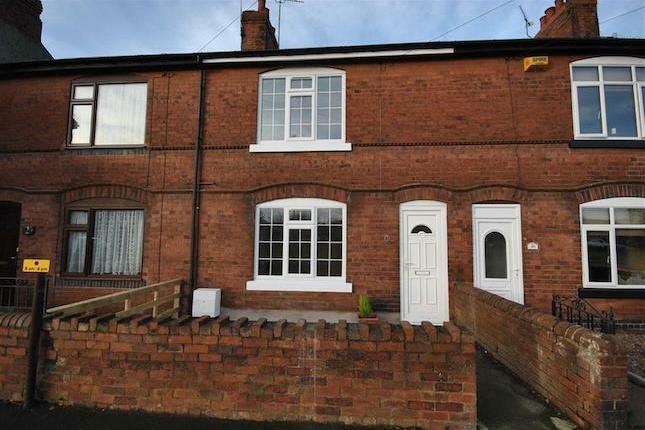 At one time you couldn’t leave your house, but it hasn’t half quietened down. This anecdotal evidence is backed up by the statistics: overall crime down by 13 per cent, criminal damage almost halved and car theft reduced by 70 per cent. 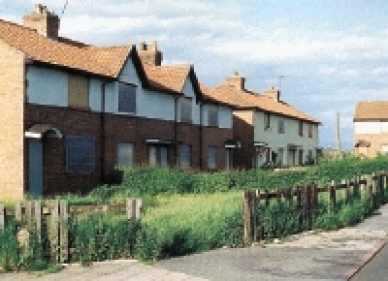 There’s no denying a success here and one which comes directly from the regeneration playbook – clearance of unpopular council homes, the introduction of mixed tenure with a range of owner occupied, social rented and ‘affordable’ homes, a diversity of housing type, and £3m spent to bring former council properties up to Decent Homes Standard. For all the success, there’s an Alice in Wonderland logic here which those in power in all parties have come to accept. Yes, as that earlier, 2000, report suggested, council housing had become unpopular and ‘residual’ – seemingly confined to those who could aspire to nothing better. ‘Demolish them; build the homes that people want’ was a natural response. And yet now what people want – and need – are genuinely affordable homes: the type of home that was cleared and the ones we’ve demolished up and down the country. Imagine £30m spent on building high-quality council houses; imagine a world where those homes weren’t residual but belonged to a mixed community to which people were proud to belong. Or, don’t imagine but remember – recall the Raffles Estate in its heyday. People will say that these are different times but I’m an historian and take a longer view. It is the property owning democracy of Thatcher (accepted by New Labour) that has come to appear transient, chimerical. What remains – or should remain – is the duty of the state to decently house its people. And to many there is once more a compelling logic that that duty is best fulfilled by building council homes. Raffles provides a microcosm of all this. Some images above are taken from a BBC Cumbria post on the Raffles Estate which contains additional images and detail. When that survey of housing need took place, Carlisle’s population included an additional 3000 munitions workers employed at the nearby Gretna Green works. They provide a fine illustration of the power and reach of the state in a time of total war – an overall workforce of 15,000 creating the weapons of war and, from July 1916, pubs and breweries in the district under state ownership – a wartime expedient to keep local munitions workers at work free from undue distraction that somehow survived through to 1971. In this context, a more benevolent expression of state power – the construction of homes – and its embrace by a conservative council might surprise us less though, of course, it wasn’t universally welcomed. One Carlisle councillor blamed the working class for the housing shortage as ‘they would not allow landlords to charge economic rents’. 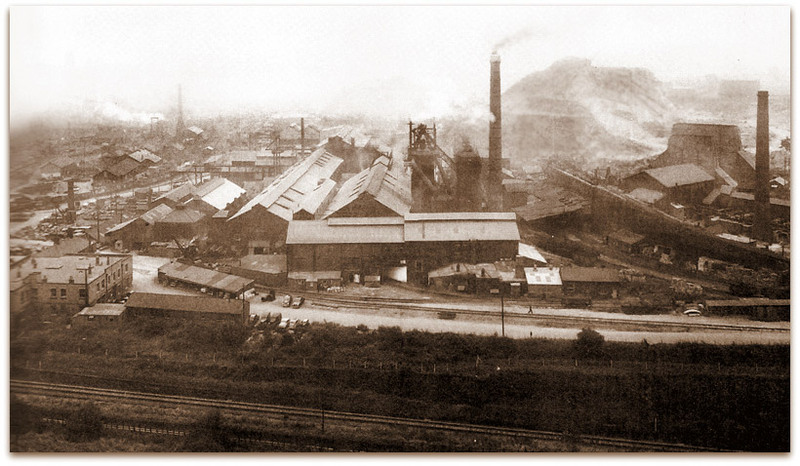 Nevertheless, the Corporation acted quickly to acquire land for building in May 1919 for the Longsowerby Estate, a mile to the south-west of the city centre, and plans for 225 houses were submitted in 1920. In the event, only 98 houses were completed under the Addison Act but the estate would grow to contain 330 homes before the next war. 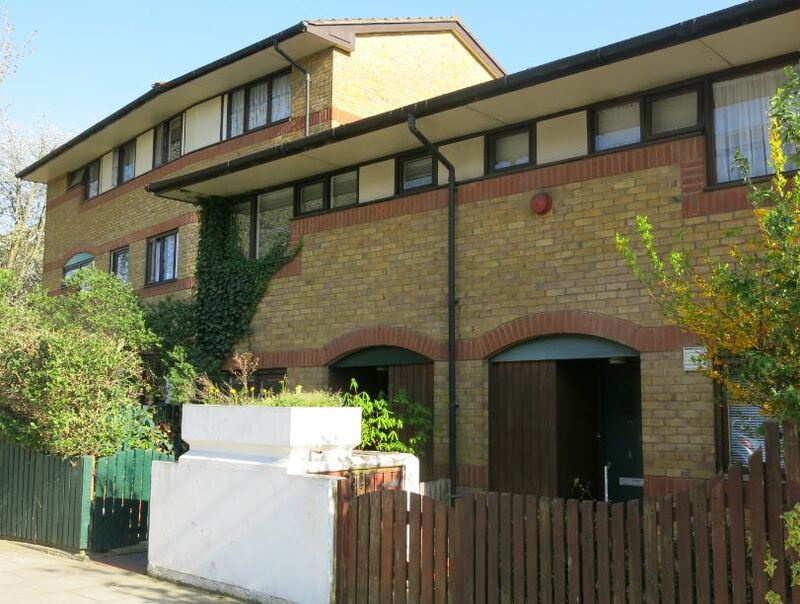 A small start was also made on the Currock Estate, just to the east, in 1921 – 40 homes built under Addison but, with progressive extensions, reaching a total of 1234 by 1939. Whilst feeling that the ideal house should have a parlour, which should be properly used, and not regarded as a museum for stuffed birds, or a handy place to store gramophones and bicycles in, it must be realised that a roomy living room is the first essential for the home. Future schemes would largely do without therefore despite the complaint of the Labour councillor who thought that ‘the working class had as much right to a parlour as anyone’. Dalton also pointed to an unusual innovation in the later homes – an external washhouse: the ‘advantage of this, in keeping all steam out of the house, will be easily realised’. But he kept quiet about a less popular aspect of this adapatation – the fact that the WC was also accessed from the back door. It was not technically an outside toilet as it remained part of the main fabric of the house but the inconvenience was widely resented. The Corporation made a small concession to complainants by providing an additional outside door where homes were next to bus stops! 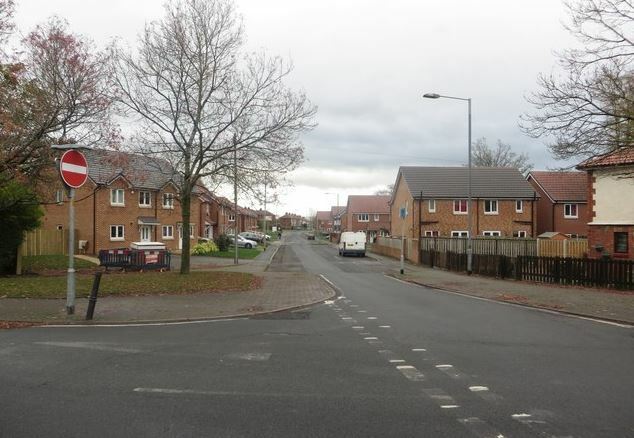 For these reasons perhaps, Longsowerby remained the most prestigious of Carlisle’s council estates. 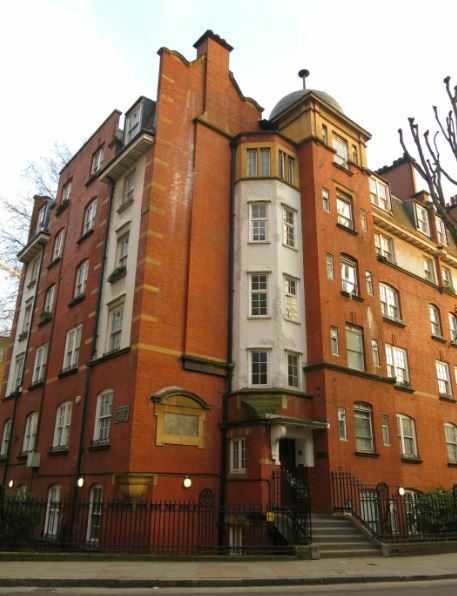 At the time of its building, some complained that middle-class employees were taking tenancies at the expense of the poorer working classes, a fact seemingly borne out by Jean Turnbull’s research which shows 12 per cent of heads of household on the Estate in 1936 were white-collar workers (compared to no more than five per cent on any of the other estates). The Raffles Estate was begun on a 98 acre greenfield site in 1926 and – at over 1500 homes – would be the largest in the city by 1939. Raffles has its own stories and story-tellers and we’ll look at the troubled history of the Estate in greater detail next week. 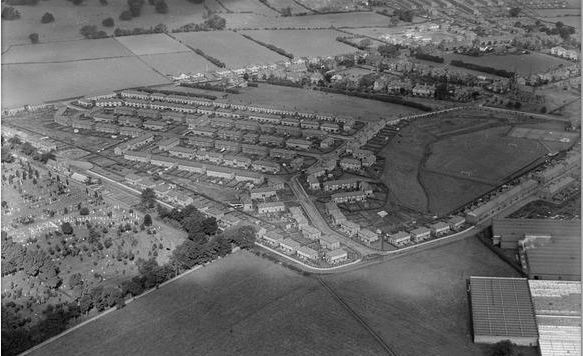 The Botcherby Estate – 544 houses on completion in 1933 – was built on 117 acres of land purchased in 1927 on the eastern periphery of Carlisle. It soon became the most unpopular estate in the city mainly as a result of its inconvenient location. Adversity bred a strong tenants’ association, active in the later 1930s in campaigning for improved bus services, better pedestrian access and local schools. There were empty homes on the Estate at this time and requests for transfer to estates closer to the centre and employment on the western side of the city. The small Fusehill Estate (renamed Vasey Crescent), built under the slum clearance legislation of 1930, was purposefully located close to the city centre. 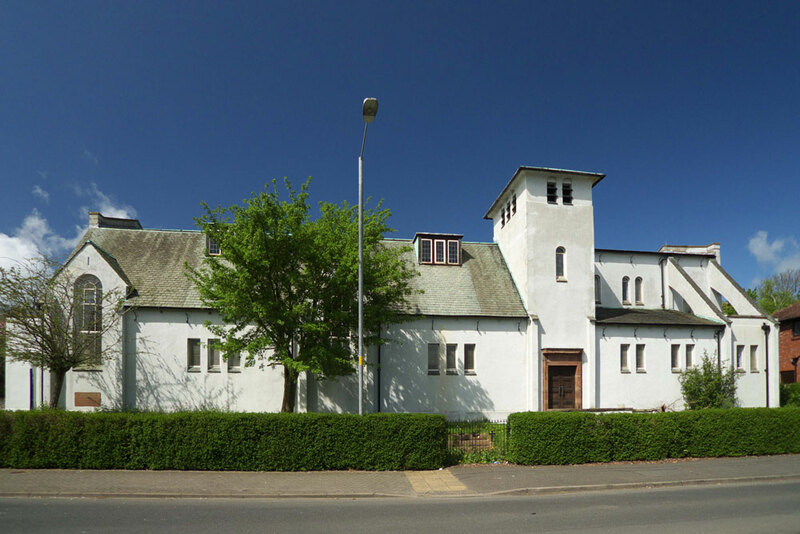 But Petterill Bank, designed for those displaced by slum clearance after 1935 was also located on the eastern fringe of Carlisle and similarly unpopular. Perhaps because of its distance, it was the only estate provided with shopping facilities from the outset and it contained a larger number of four- and five-bedroom houses, in order to house larger families from the inner-city. 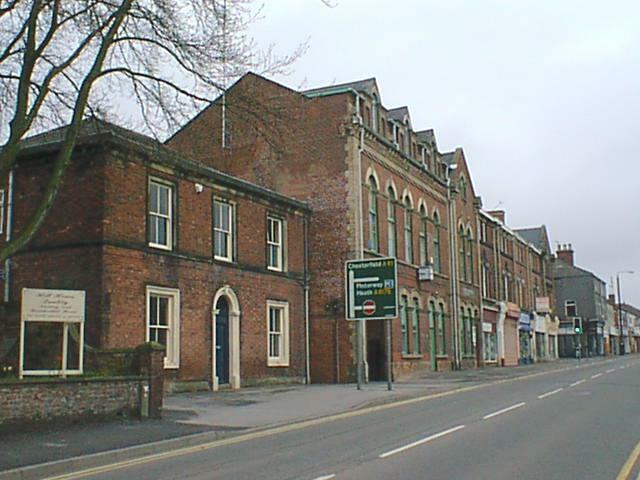 In fact, Carlisle’s efforts to clear the slums – particularly the notorious Caldewgate district of the city – had begun early, in the 1920s and it had rehoused 525 families before 1935. At around 75 per cent of those displaced this was a creditable record but in general council housing remained disproportionately the prerogative of the better-off working class. In Carlisle, in particular, a good many council tenants – 42 per cent – were employed on the railways. Railway workers, particularly those in the higher grades, were a labour aristocracy at the time and, as the industry was the city’s largest employer, the figure is not altogether surprising. But it remains highly disproportionate – in 1919 only around 13 per cent of the local workforce worked in the industry. One tenant later recalled that railway workers were ‘like freemasons’ and almost always got council housing if they wanted it. Labour councillors may have kept quiet about that particular unfairness but they were quick to accuse the Council of favouritism in its allocation procedures in its alleged preference for those who could pay reliably over those in greatest need. 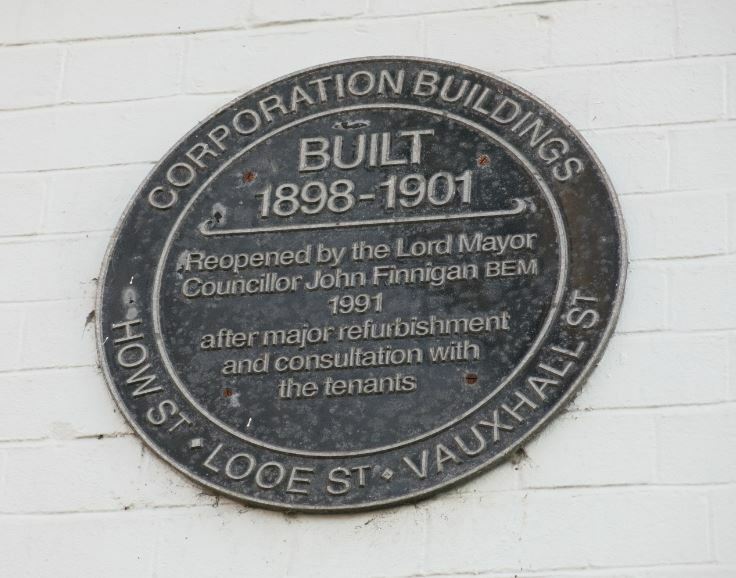 In 1931 – and we might savour this as a symbol of very different times – it was said some new tenants had previously been owner-occupiers and some had sold homes in order to move into council accommodation. The Corporation built 4702 houses in the interwar period and by 1939 around 27 per cent of occupied homes in Carlisle were Council-rented. In the 1950s that proportion would reach 60 per cent and already some of the hopes and dreams of earlier years were a little faded. We’ll explore that story and the rise and fall of the Raffles Estate next week. 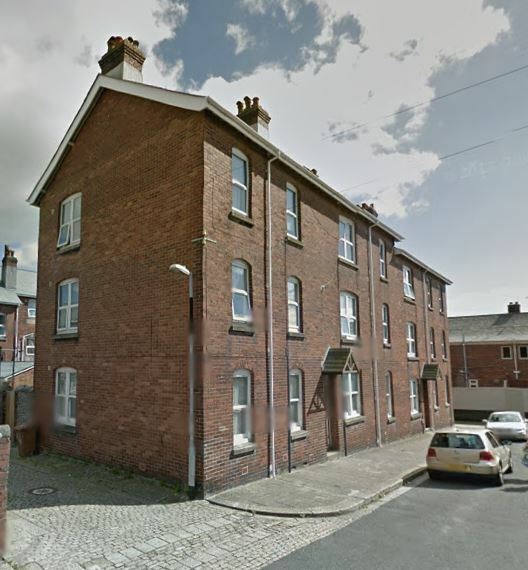 (1) Quoted in Jean Turnbull, ‘Housing Tenure and Social Structure: The Impact of Inter-War Housing Change on Carlisle, 1917-1939’, University of Lancaster PhD, 1991. Other detail and analysis which follow are drawn from this very informative source.